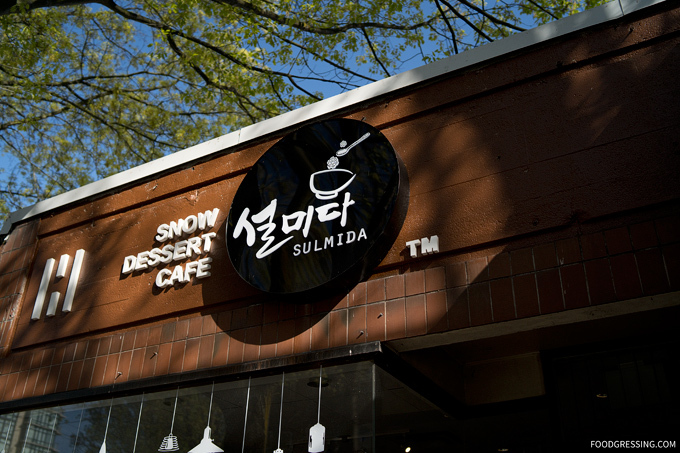 One of the sweet additions to the West End neighbourhood is Sulmida Korean Dessert Cafe. This is Sulmida’s third location in Metro Vancouver with two other ones in Richmond and Burnaby. 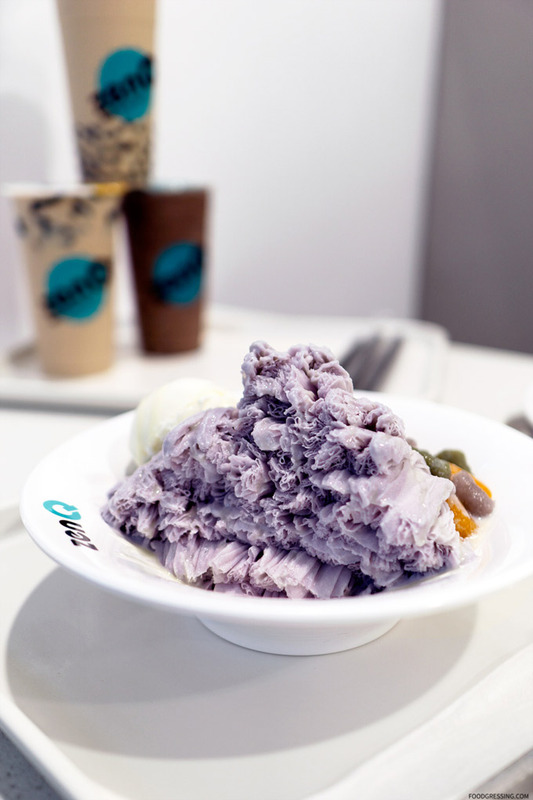 The cafe specializes in bingsu (variants “patbingsu,” “bingsoo”) which are shaved milk-ice desserts. I had been to Sulmida’s locations before and liked the experiences there. The incentive to visit was particularly sweetened when I bought their Groupon deal of 2 bingsu for $21. Here’s a look at my experience at Sulmida Downtown Vancouver. I like Sulmida’s bright, modern spacious interior which is definitely a lot bigger than the Burnaby one but comparable in size to the Richmond location. 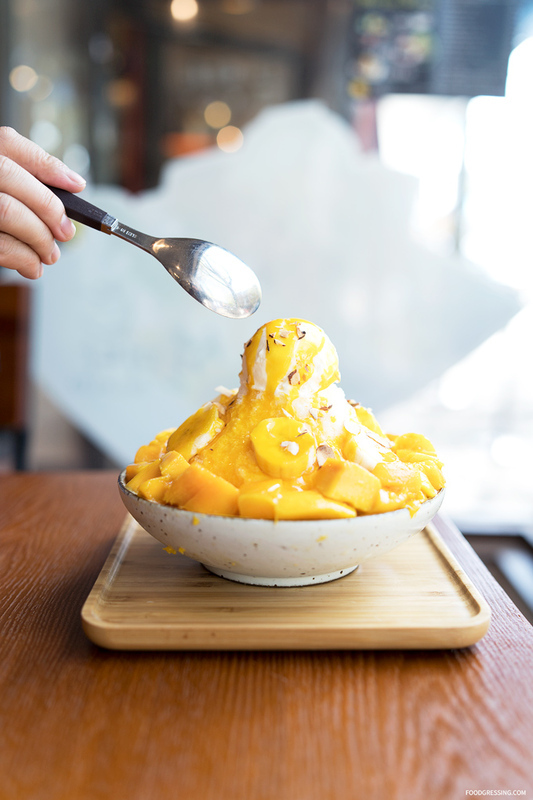 Sulmida Downtown has 12 different options of bingsu like Green Tea, Mango Cheese, Nutella Banana and more. 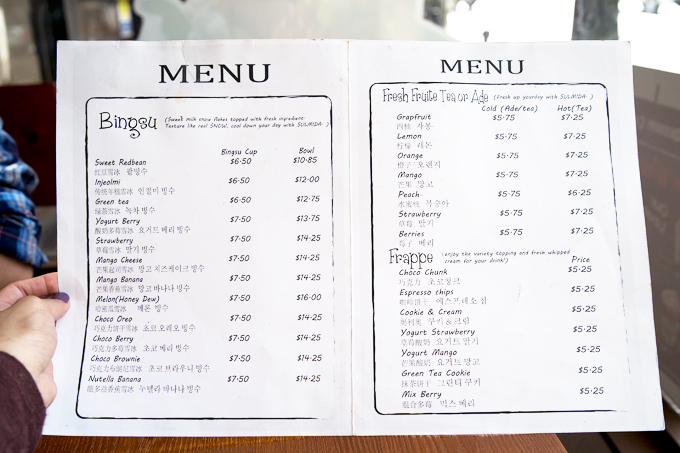 The bingsu come in either a cup ($6.50 – $7.50) or a bowl ($10.85 – $16). For beverages, they offer hot and cold espresso-based drinks, fruit ades, frappes and so forth. Other dessert options include lava bread and dessert toasts. The Groupon deal was $21 for 2 bingsu and I went with the Mango Banana (regular $14.25) and the Honey Dew Melon (regular $16). In both cases, the shaved mik-ice were light, fluffy and had a nice milky taste. The portions of fruit offered were reasonable as well. 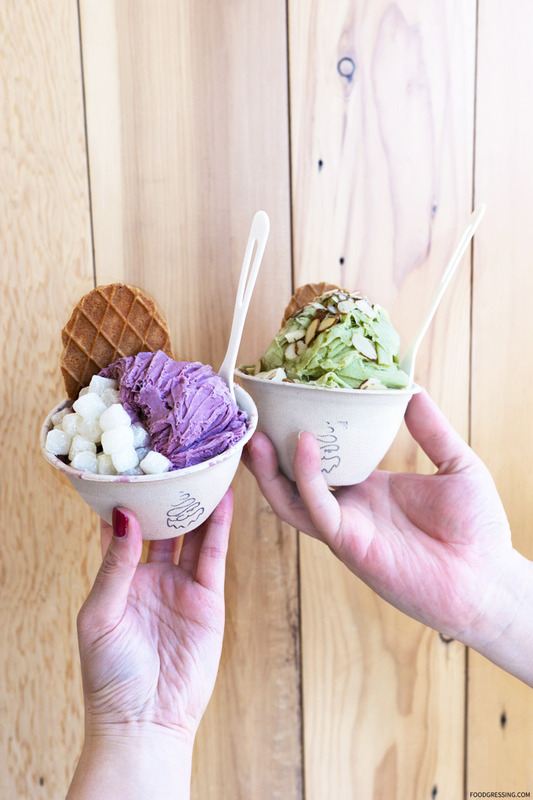 Based on the size of the desserts, these bowls are definitely meant to be shared. I thought the vanilla ice cream was creamy and not overly sweet and the sliced almonds added a fun textural contrast. The mango used was just a bit tart but the syrup seemed to balance it out nicely. 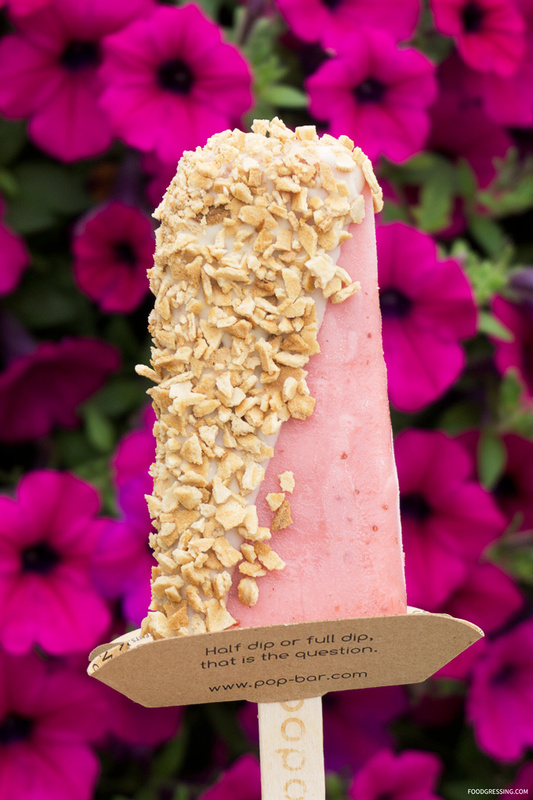 I have been a fan of popbar ever since they expanded into the Metro Vancouver. Their natural, preservative free and made fresh daily gelato treats are very tasty in my books. 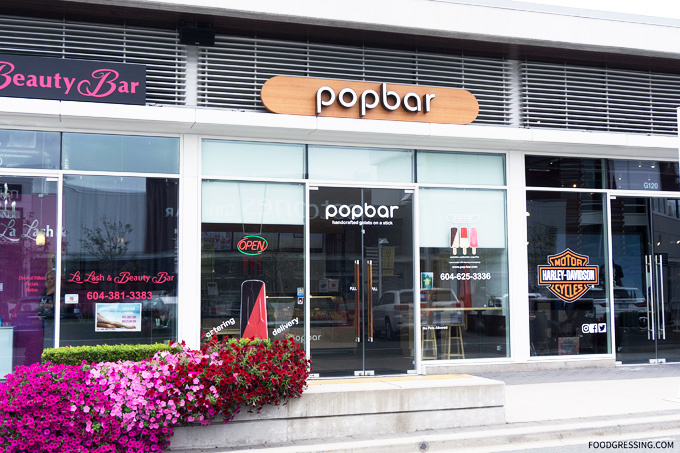 I had already been to popbar at Metrotown and Tsawwassen Mills so I was excited to visit their Fraser Valley location at Highstreet Mall in Abbotsford. Disclosure: I visited this location as media and received complimentary products to try. 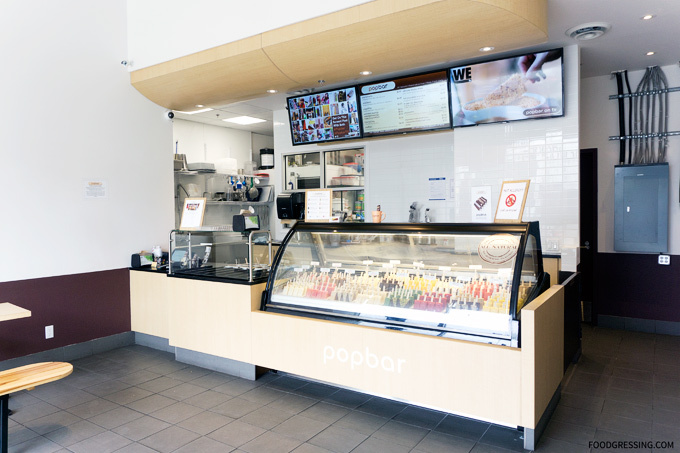 Compared to the other BC locations which are small outlets within malls, popbar Abbotsford is more of a stand-alone store. They have their own dining table area. 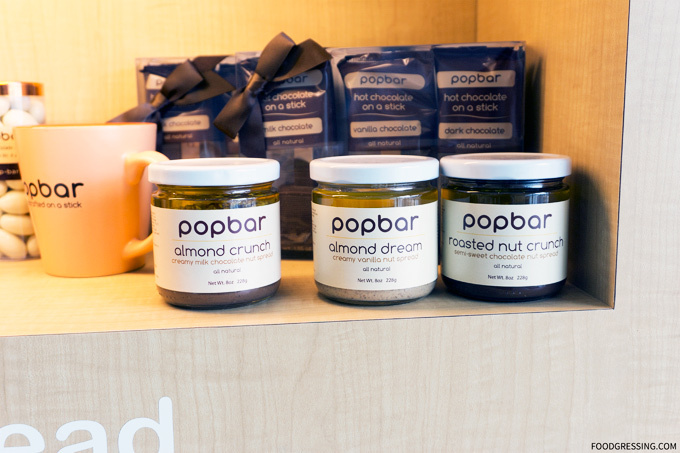 I also noticed that popbar Abbotsford has quite a few products for sale. 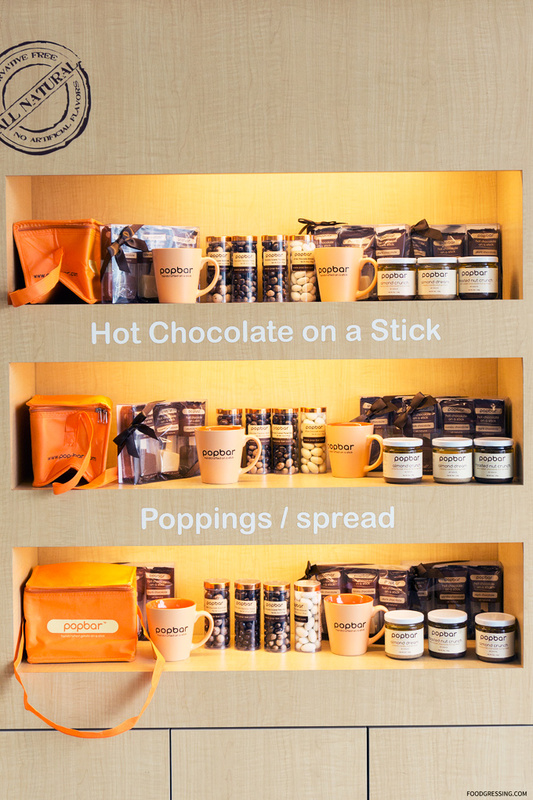 There are popspreads (like almond crunch and almond spread) and poppings to go (including chocolate espresso beans, white chocolate almonds and more). 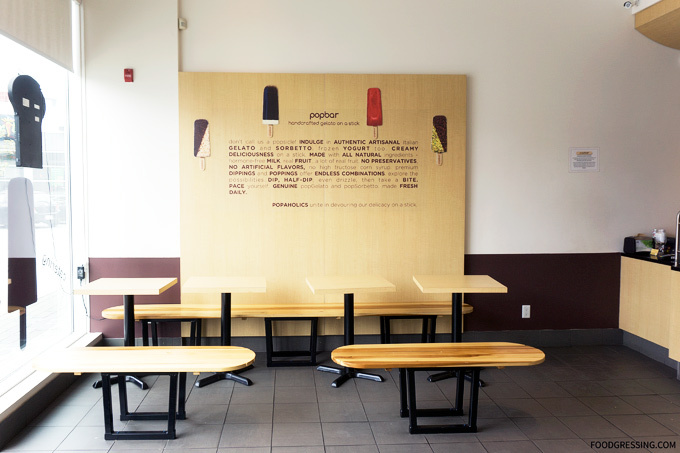 Like other popbar locations, the Abbotsford store offers a tasty array of treats include the popSorbetto, popGelato, yogurtPop, ultimate double shake, hot chocolate on a stick, frozen hot chocolate, popaccino and more. 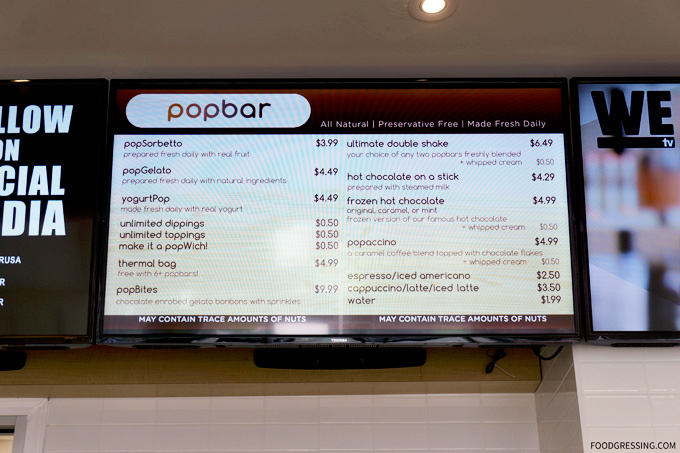 You can customize each treat with unlimited dippings or poppings for $0.50 each. You can also make it a popwich (a gelato sandwich) for $0.50. Also on the menu are a few espresso-based drinks like cappuccino, latte, and so forth. I tried the strawberry yogurt pop ($4.49) with a white chocolate dip ($0.50) and waffle cone topping ($0.50). I also enjoyed the dulce de leche gelato ($4.49) popwich (+$0.50) with chocolate sprinkles (+$0.50), white chocolate dip ($+0.50) and a green tea drizzle (+$0.50). I’ve enjoyed the popwich in the past and this did not disappoint. I absolutely love the cookies that they use because they are absolutely crunchy. 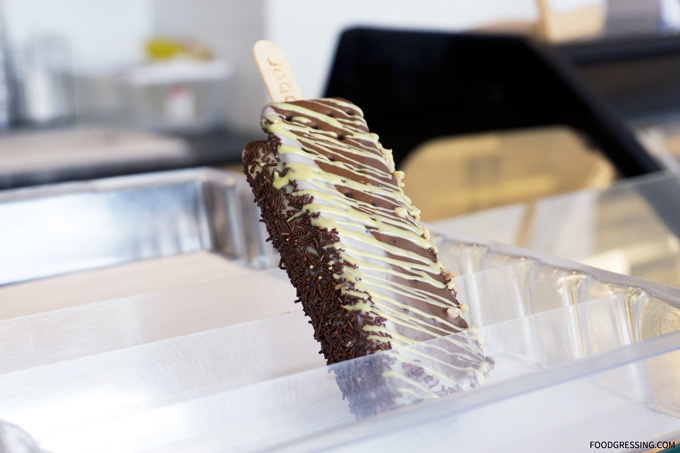 I really enjoy how popbar Abbotsford has its own dining area where you can sit down and enjoy the treats with friends. The treats are made with quality ingredients and have a very nice flavour. I would recommend giving them a try. 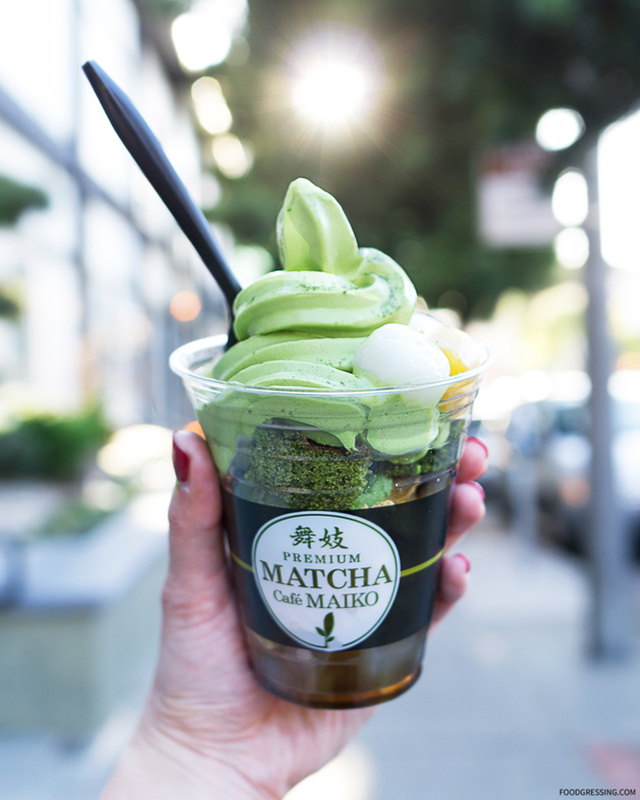 Bay area matcha lovers, rejoice! 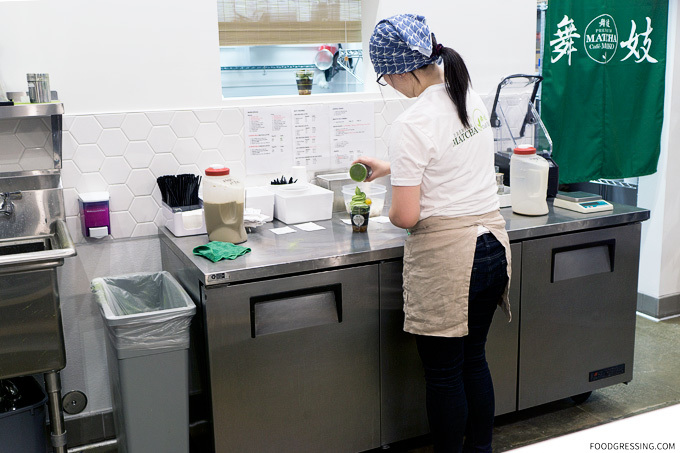 San Francisco’s first matcha cafe, Matcha Cafe Maiko, has now opened in Japantown. 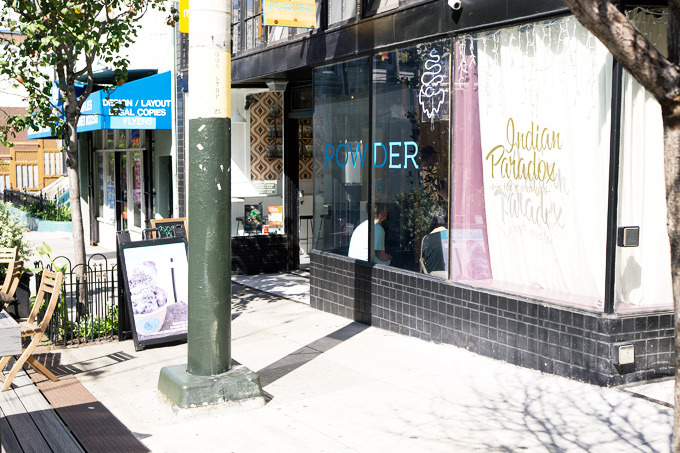 The much-anticipated opening was hyped up on social media and I was excited to have visited the cafe while I was in San Francisco last week. 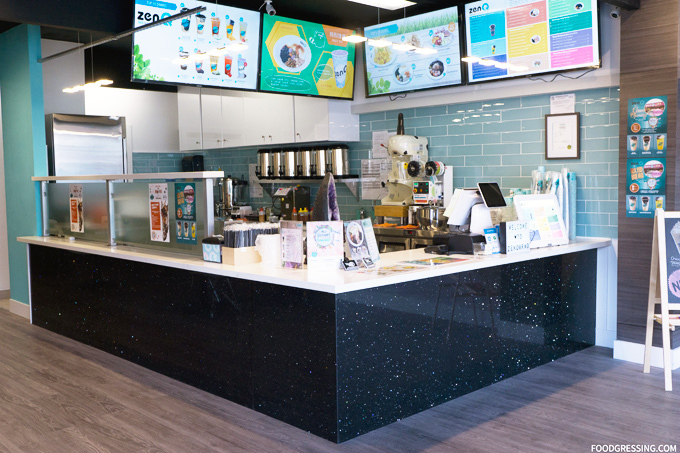 Located inside the Japan Center Kinokuniya Building on Webster Street, this will be cafe’s third location with its original location in Honolulu and second in Tokyo. 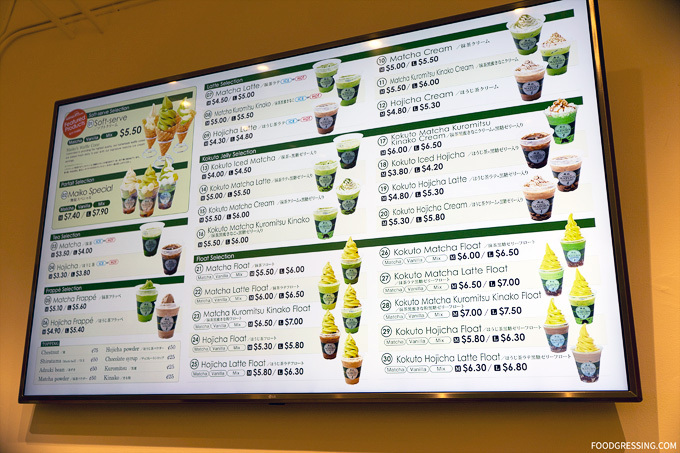 On the menu at Matcha Cafe Maiko are matcha soft serve, frappes, lattes, floats and more. The items generally come in either medium or large size. Prices typically range between $4 – $8. Matcha Cafe Maiko sources their matcha from Uji, which is in the southern part of Kyoto and is known for their high-quality matcha. 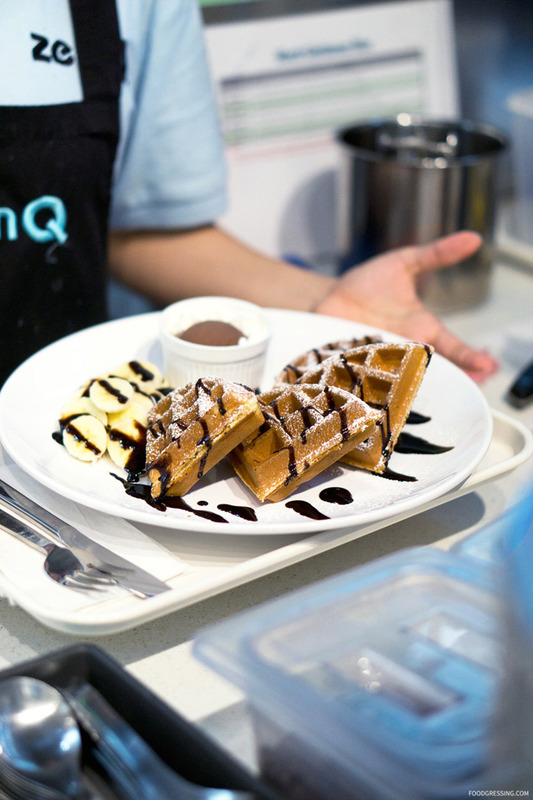 Furthermore, their products including ice cream, sponge cake, waffle cones, and even the adzuki bean toppings, are made in-house. Matcha Cafe Maiko is located on the ground floor of the Japan Center Kinokuniya Building. It’s a small cafe with limited seating inside but there are plenty of places to sit in the mall. Given the popularity of the cafe right now, it seems like a lineup is quite common. Stanchions were setup to facilitate lineups by customers. The process from ordering to receiving the food was less than 10 minutes. Staff seemed friendly and enthusiastic, especially the franchise owner. Note: This review is not sponsored and is done anonymously. I tried the cafe’s signature parfait, the Maiko Special. It’s a layered treat which has plant-based jelly, Japanese brown sugar syrup, corn flakes, red beans, homemade matcha chiffon cake, mochi balls, and chestnuts, topped with soft serve (either matcha, vanilla or mix). Having tried something similar in Vancouver at Bon Crepe, I thought the Maiko Special was of higher quality and more refreshing. 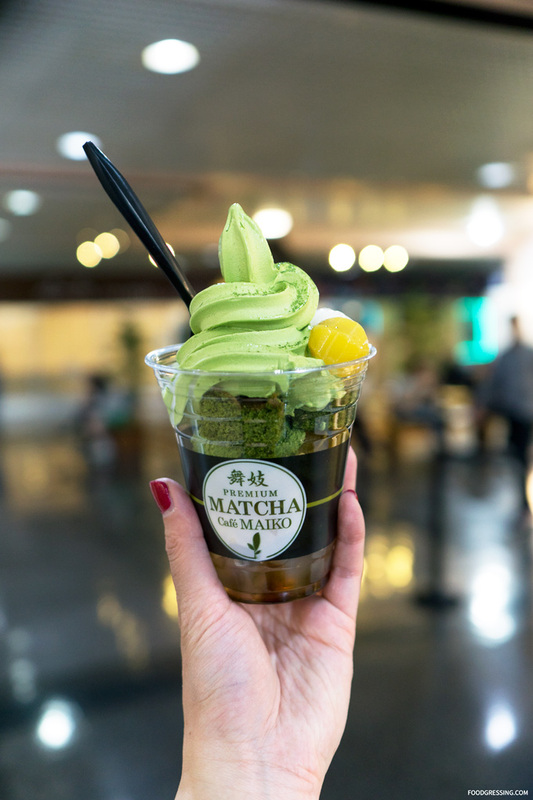 The matcha used in the soft serve had just the right amount of matcha bitterness to complement the sweetness of the vanilla soft serve. The highlight for me was actually the chiffon cake which was amazingly light, fluffy and was just perfect in terms of matcha and sweetness; that cake most definitely tasted fresh and made in-house. The mochi balls were nicely chewy but I particularly liked the jelly which was very soft, smooth and light. Overall, it was a delicious dessert that I would gladly have again. 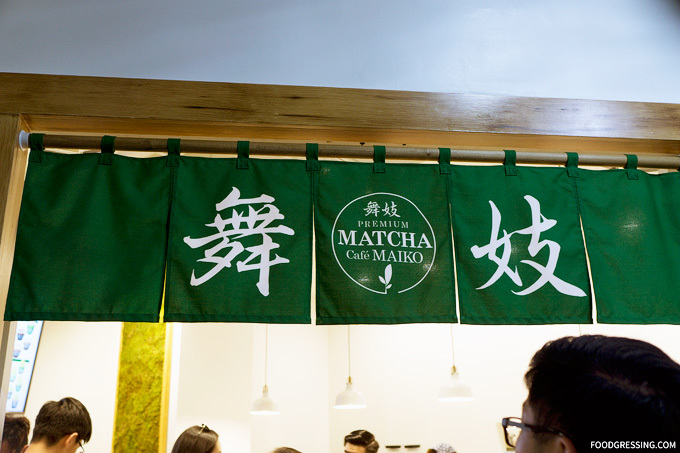 I spoke briefly with the franchise owner, Chris Chin, and he mentioned to me that a location of Matcha Cafe Maiko is planned for Vancouver. 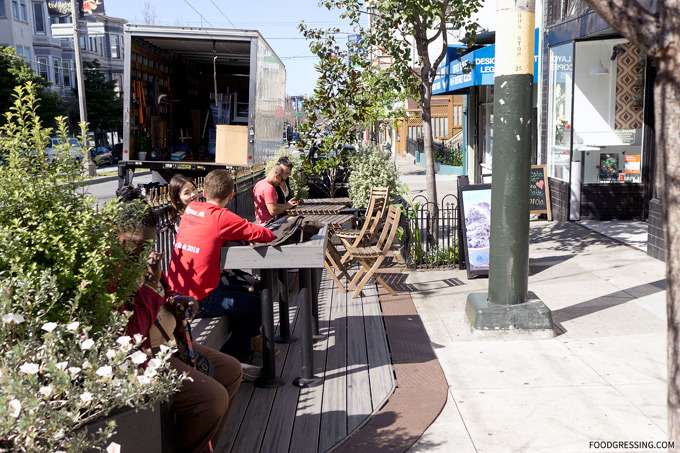 This information was also noted in this article by Eater SF. There is no official word on the timing of the opening. If you have a sweet tooth, you’ll be excited to know that a new dessert spot has just opened in Richmond. 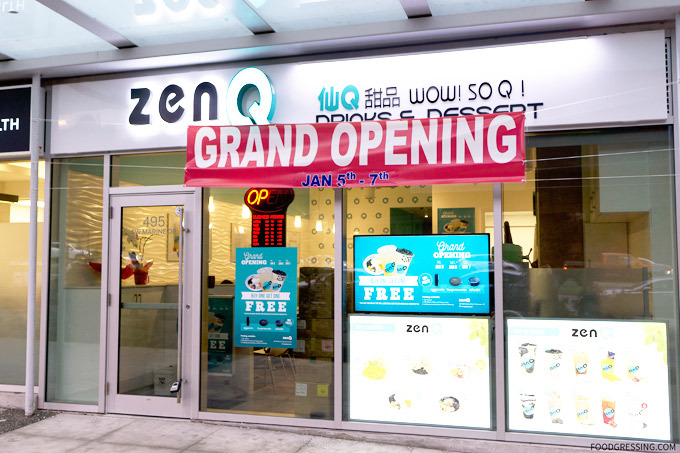 Taiwanese-based dessert chain, ZenQ, has just expanded to a new fourth location in BC. Located at 3471 No. 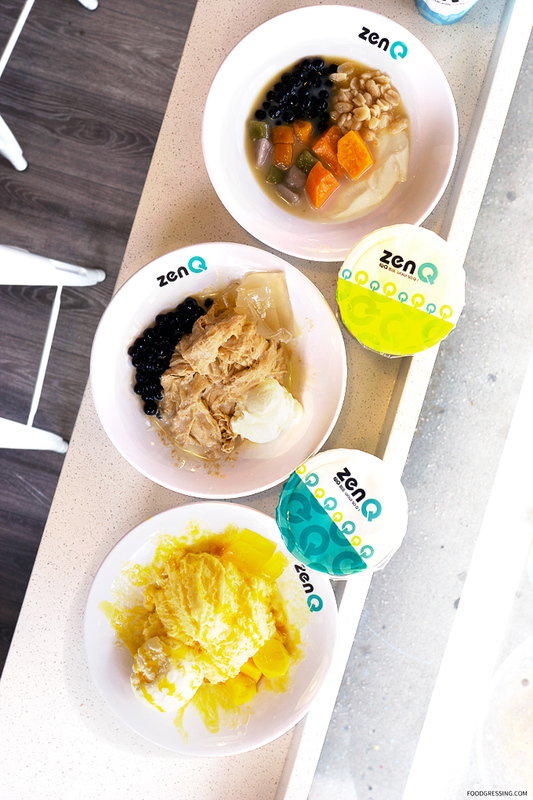 3 Road, ZenQ Richmond specializes in Taiwanese desserts ranging from their signature collagen-riched grass jelly series to glutinous rice desserts and shaved ice series. 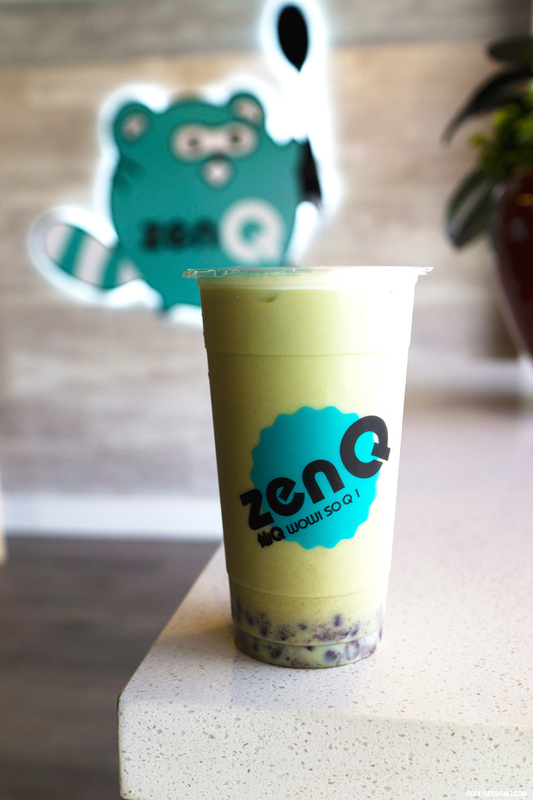 I visited ZenQ ahead of their official Grand Opening tomorrow. 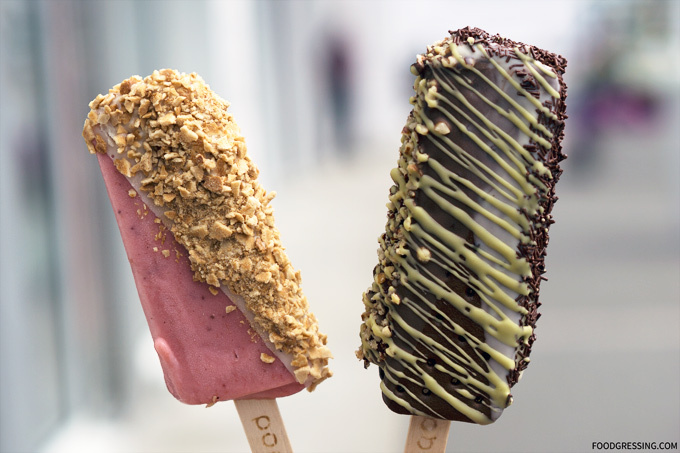 Here’s a look at what you can expect from this new dessert stop in Richmond. Disclosure: I was invited to a media tasting. All food and drinks were complimentary. Opinions are my own. 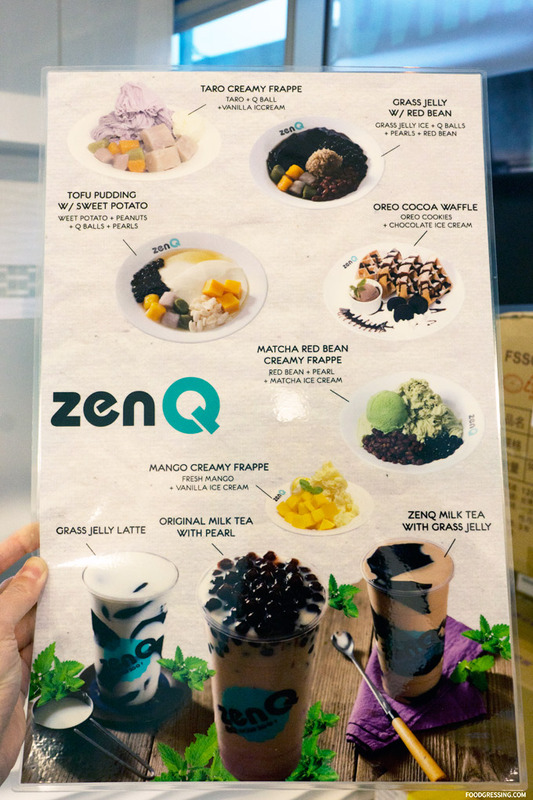 On the menu at ZenQ are a variety of Taiwanese-style drinks and desserts. 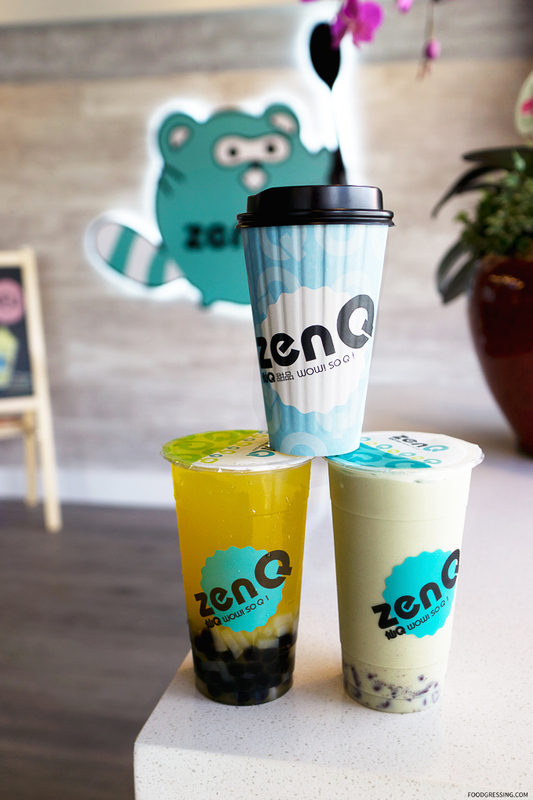 Drink series include ZenQ Tea Time Collection (like Original Milk Tea and Wintermelon Tea); Handmade Tea (like Jasmine, Black and Blue Mountain Green); and Special Drinks (like Grass Jelly Latte and Mango Refresher). 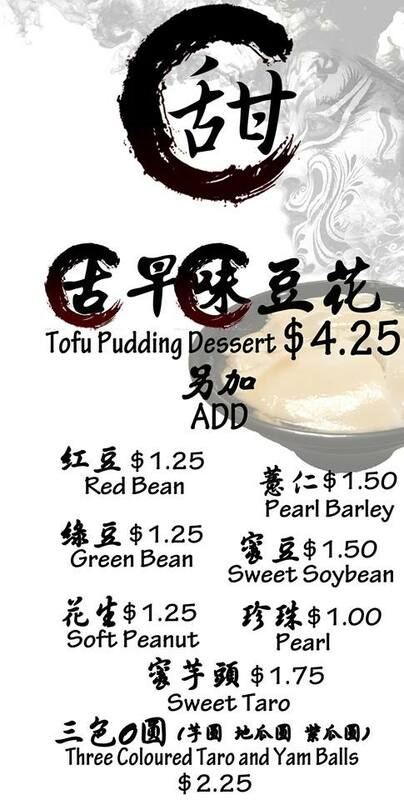 For desserts, there are Tofu Puddings, Grass Jellys, Creamy Frappes, Royal Sweet Soups, Black Glutinous Rice, Hot Grass Jelly, Waffles and Hot Sweet Soups. Additional toppings are available at an extra charge. 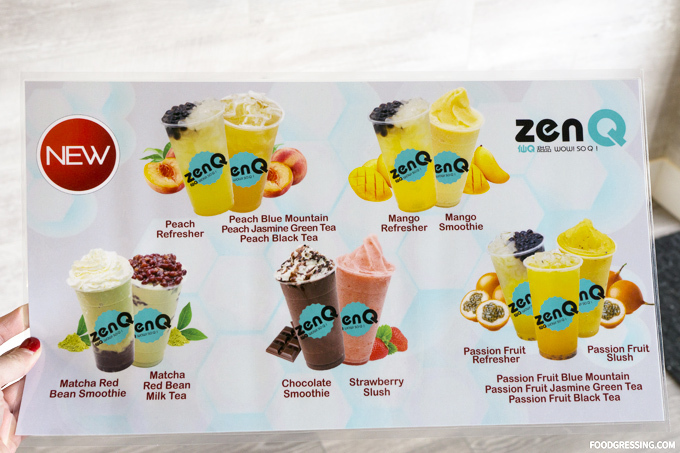 New drink additions to the ZenQ menu include Peach Refresher, Manger Smoothie, Matcha Red Bean Smoothie, Strawberry Slush and more. 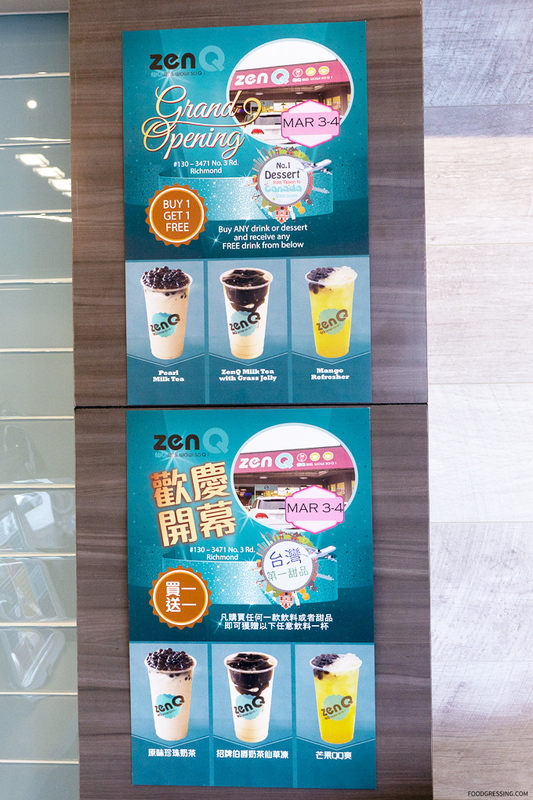 For the Grand Opening weekend on March 3 – 4, you will receive a free drink (Pearl Milk Tea, ZenQ Milk Tea with Grass Jelly, or Mango Refresher) with any drink or dessert purchase. 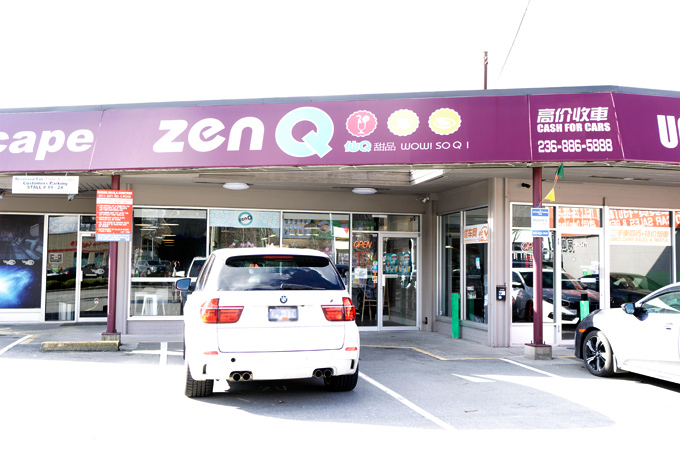 ZenQ’s new Richmond location is more spacious than the Marine Drive one. There is a variety of seating here ranging from lounge seating, dining tables for 2 or 4 as well as a counter along the window. Thanks to Chinesebites.com, I had the opportunity to try three drinks and three desserts. As a lover of mango desserts, I was excited to try the Mango Creamy Frappe featuring fresh mango, mango jelly and ice cream. 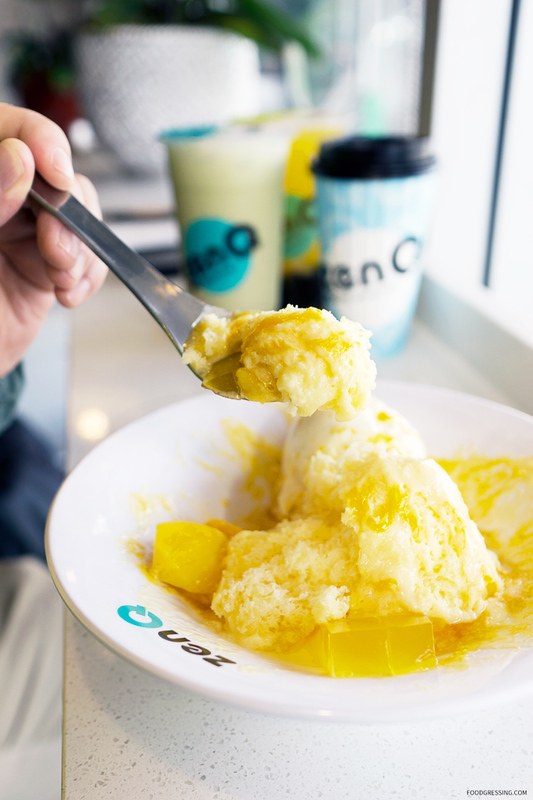 The mango flavours were more on the subtle side for both the shaved ice and the ice cream but it was overall freshing. My favourite part was actually the mango jelly which had a nice firm yet gelatinous texture. I absolutely loved this dessert which had lychee jelly, pearl and vanilla ice cream. I love a classic pearl milk tea flavour and this frappe version didn’t disappoint. The lychee jelly was particularly delicious. 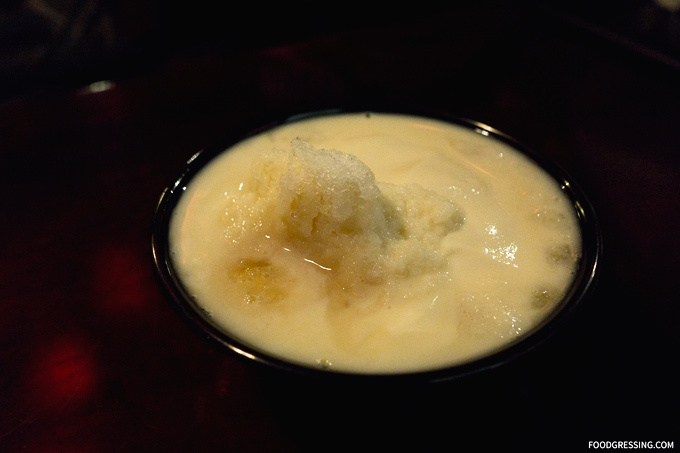 A must-try at any ZenQ location is the tofu pudding. This time, I had the Tofu Pudding with Sweet Potato, Peanuts, Q Balls and Pearls. An overall very smooth dessert with the tofu pudding being silky; the peanuts being crunchy; the Q balls and pearls being chewy but soft on the inside; and the sweet potato being soft and sweet. 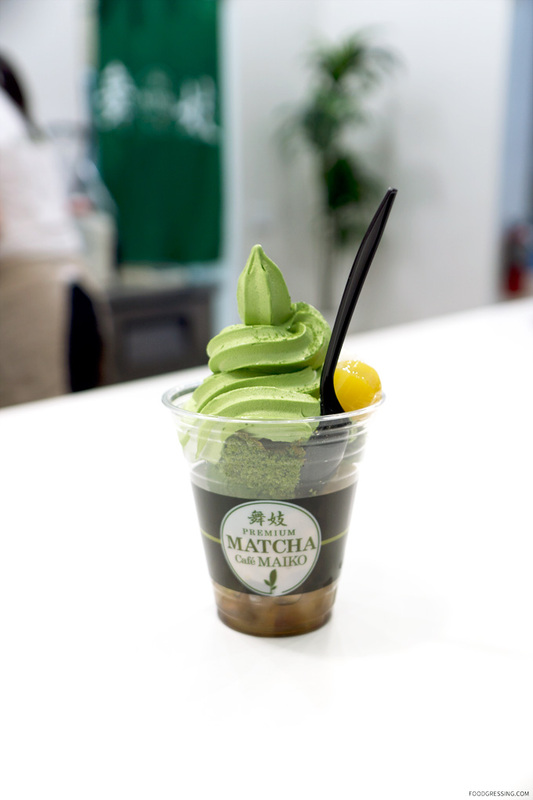 A blend of matcha milk tea, whipped cream with red bean toppings. A peach-flavour drink that comes with pearls and coconut jelly. 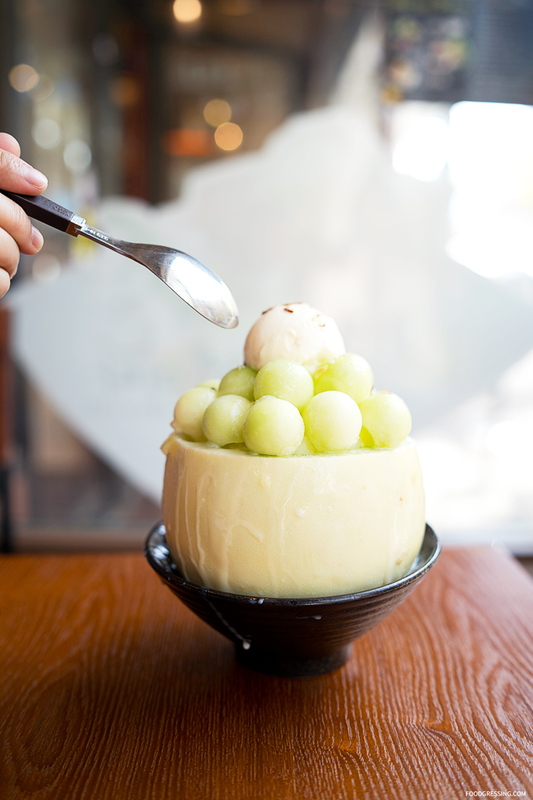 Richmond is a hotspot for Asian dessert cafes and 有香 Sweet Memory Dessert 甜點輕食 is one that specializes in Taiwanese desserts. 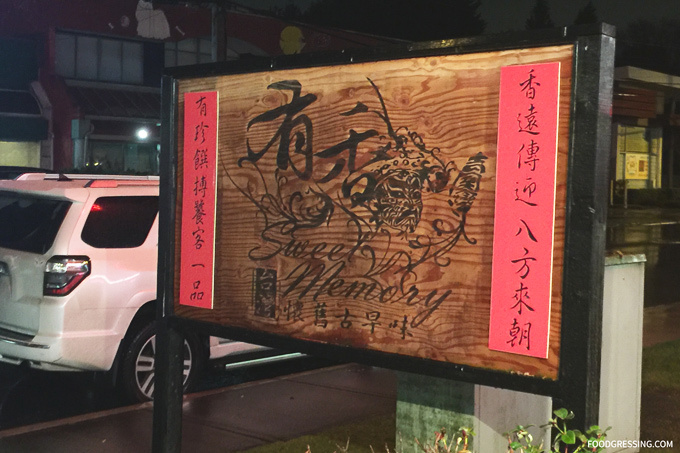 If the name sounds familiar, it’s because they are the sister restaurant of Sweet Memory Corner, an award-winning restaurant on Three Road that serves authentic Taiwanese cuisine. After having a media dinner at Beijiang Restaurant, a group of us decided to finish off the evening on a sweeter note. 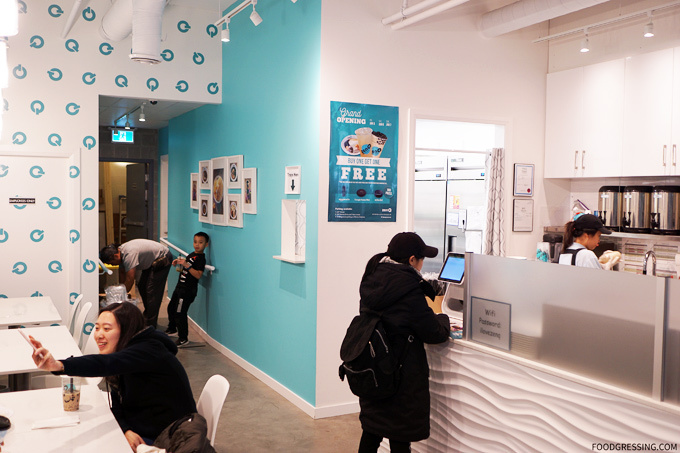 We ventured across the street to Sweet Memory Dessert – a recommendation by Picky Diner. Disclosure: None of the food and drinks in this review were complimentary. This review is done anonymously. Opinions are my own. 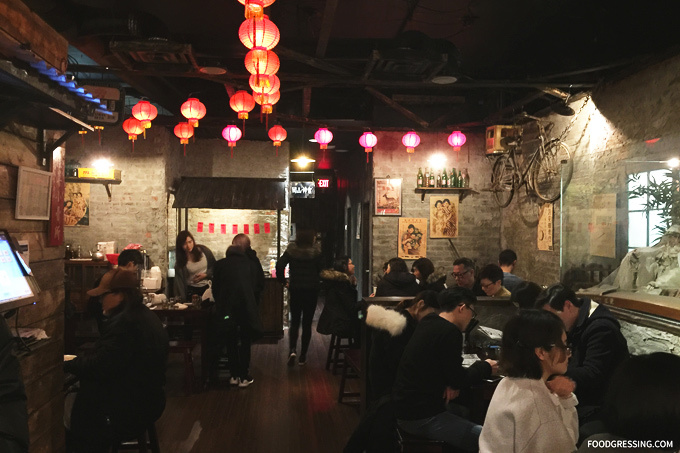 The interior of Sweet Memory Dessert exudes a Taiwanese retro charm with overhanging red lanterns, concrete covered brick walls, and vintage posters. It felt very much like an old Chinese Village setting where people are dining al fresco. For seating, there are many 2 – 4 people wooden tables with wooden stools. 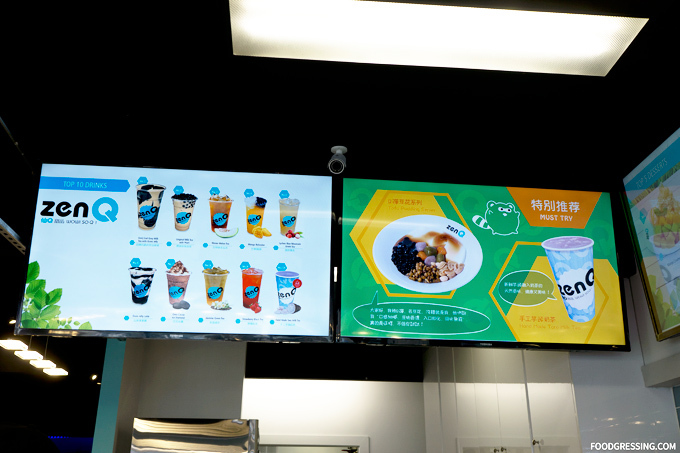 For dessert options, Sweet Memory offers Tofu Pudding Dessert, Traditional Shaved Ice, Grass Jelly, Coffee Jelly, Jasmine Jelly and more. 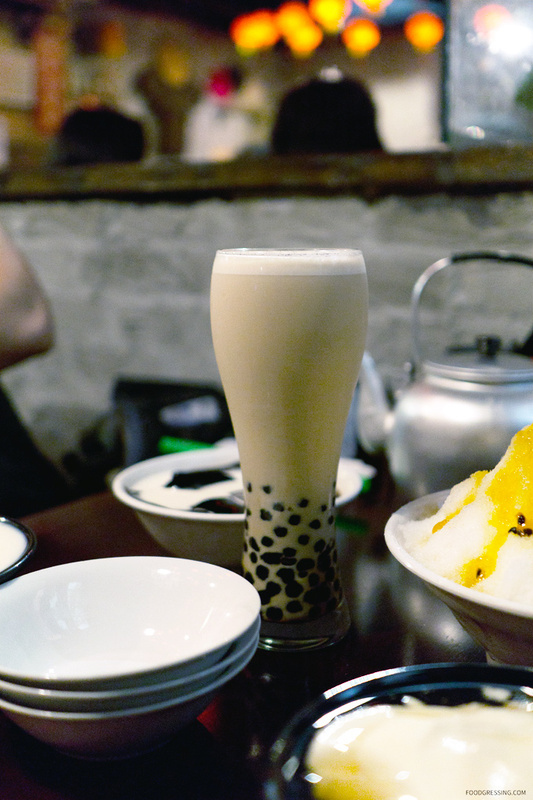 They also have a wide selection of Bubble Tea Drinks including Milk Tea, Slushies, Milk Caps and so forth. 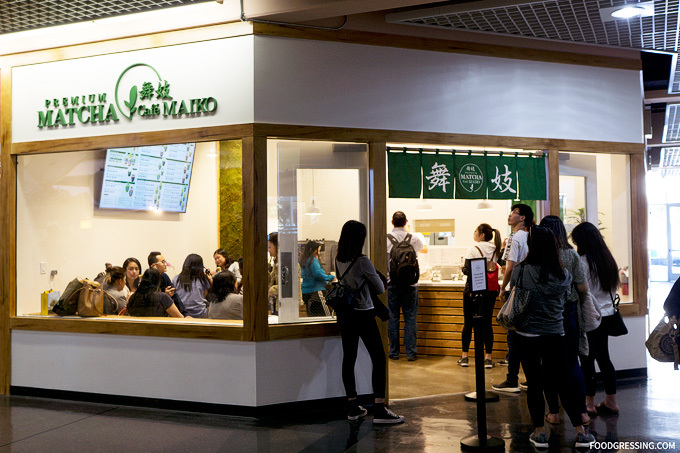 Aside from desserts, they also have savoury Taiwanese snacks like Taiwanese Meat Sauce on Rice, Pork Intestine Thin Noodles, Meat Ball in Rice Wrap and more. They accept cash for payment only. 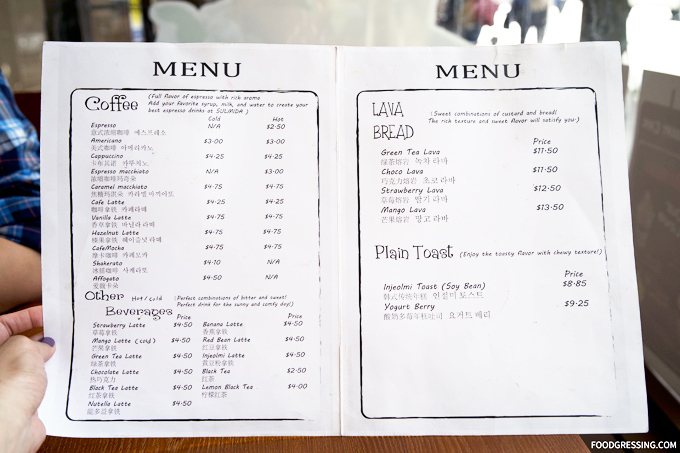 I have compiled a pdf of their menu using menu photos posted on Facebook. To see the Sweet Memory Dessert menu, click here. Items and prices subject to change. We were surprised by the size of the shaved ice. It’s certainly a dessert that can be shared between two people. 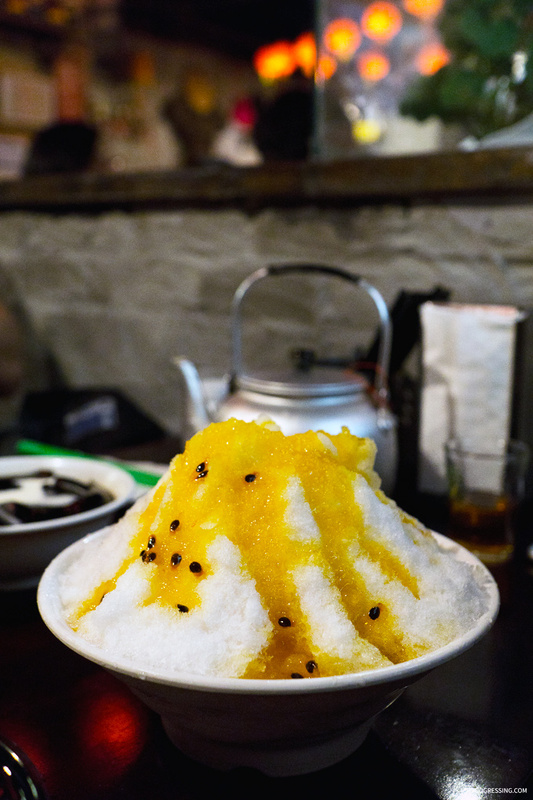 The shaved ice had a subtle milky flavour but the the passion fruit syrup was too sweet for my liking. I found the house-made tofu very silky, smooth and delicate. The pearls were soft and smooth on the outside but gradually more chewy towards the centre. Very refreshing. Pro Tip: Don’t panic! All the add-ons are hidden underneath the tofu. Dinner recommendation in the same area, try Beijiang Restaurant. See review here. 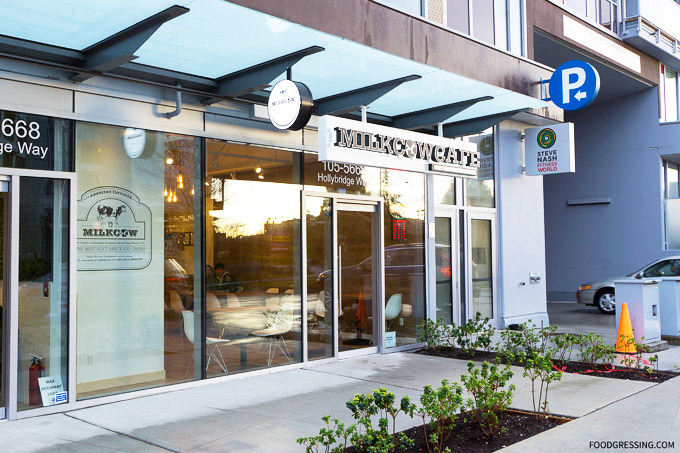 Newly opened in Richmond is Milk Cow Cafe, a South Korean-based dessert cafe specializing in organic soft serve with creative toppings. 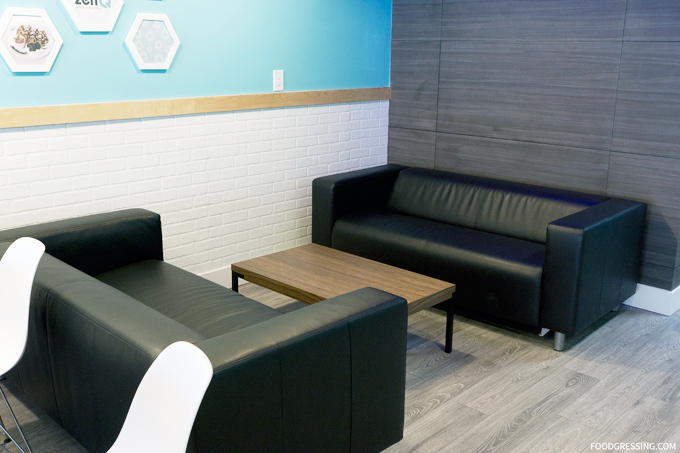 Located within the Richmond Olympic Oval district, this is currently the only Canadian location for the Korean chain which has over 50 locations worldwide including USA, Australia, UAE and more. This store is owned and operated by two brothers which I found out after talking to one brother who was working at the time. 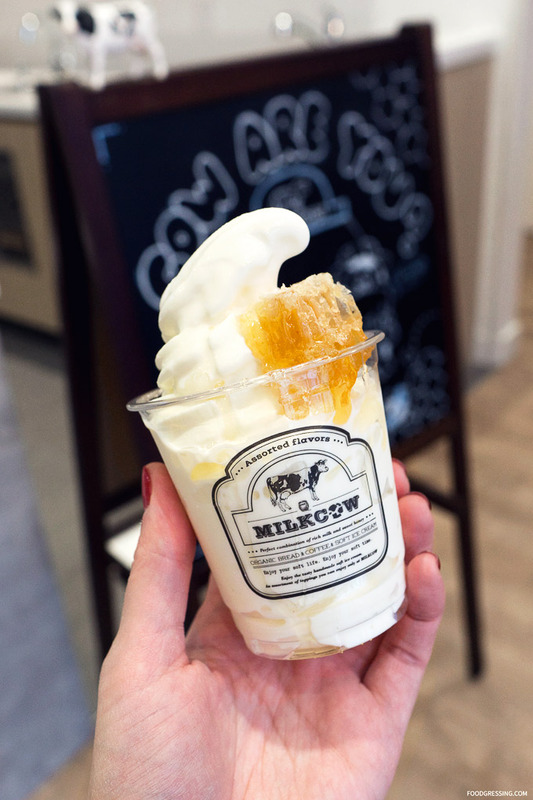 I visited Milk Cow Cafe earlier today to try some of their soft serve offerings. 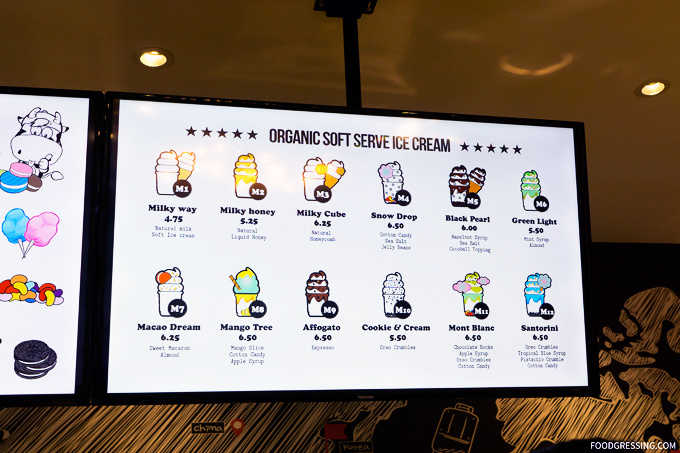 On the menu at Milk Cow are 12 options for organic soft serve ice cream. The Milky Way is their base soft serve with no toppings. 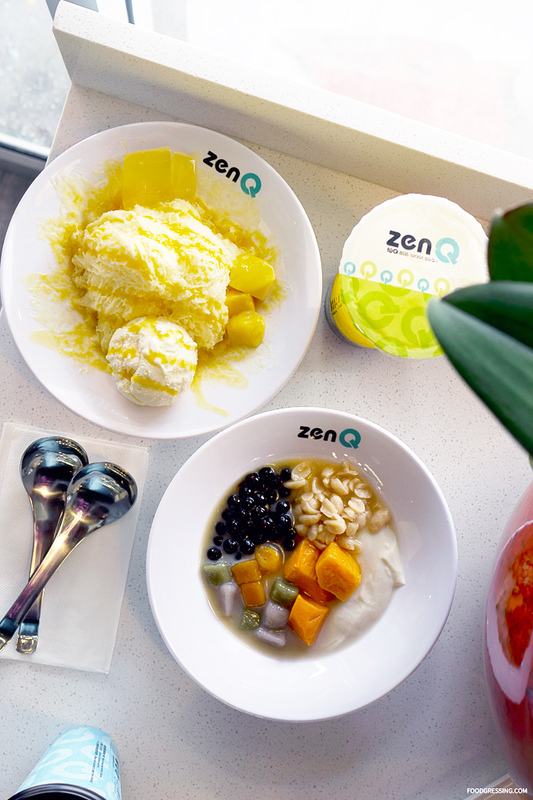 All their desserts have the same natural milk organic soft serve but differ in toppings such as Cotton Candy, Jelly Beans, Apple Syrup, Chocolate Rocks and more. 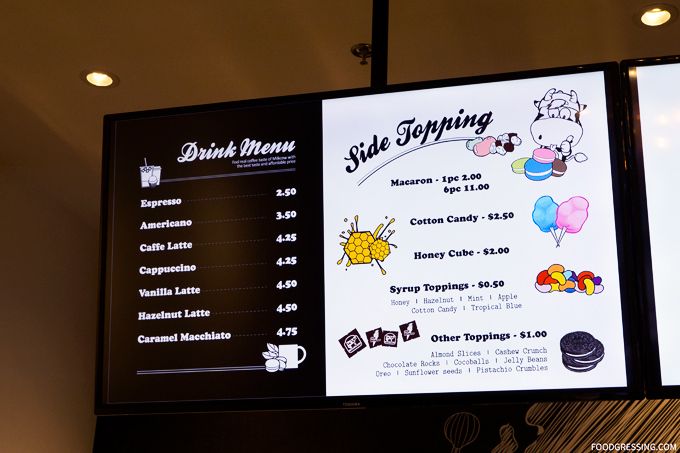 The soft serve are priced between $4.75 – $6.50. 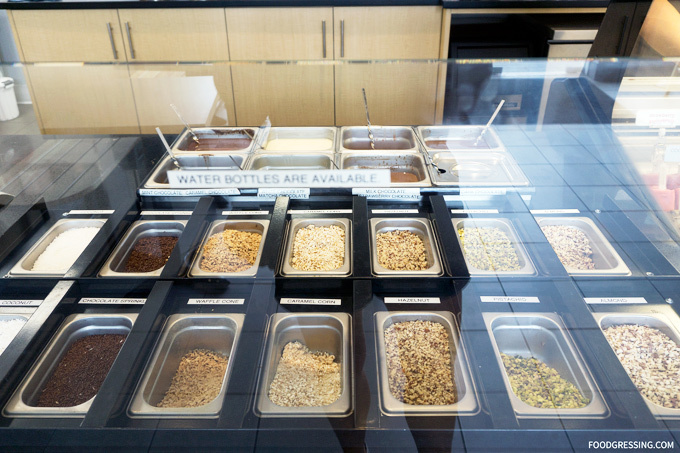 You can also order other toppings for an additional cost. Also available are espresso-based drinks made with organic coffee (like latte, cappuccino, macchiato and more). They currently accept cash or debit only. 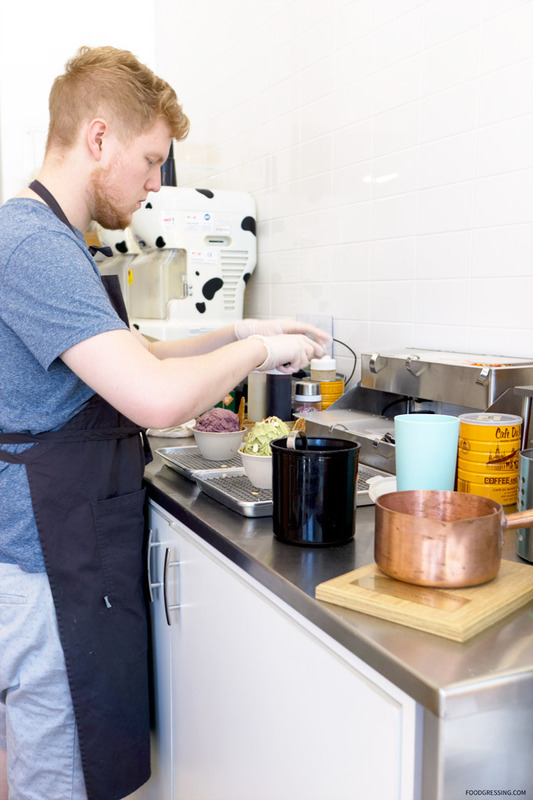 In terms of process, the desserts are assembled on order. 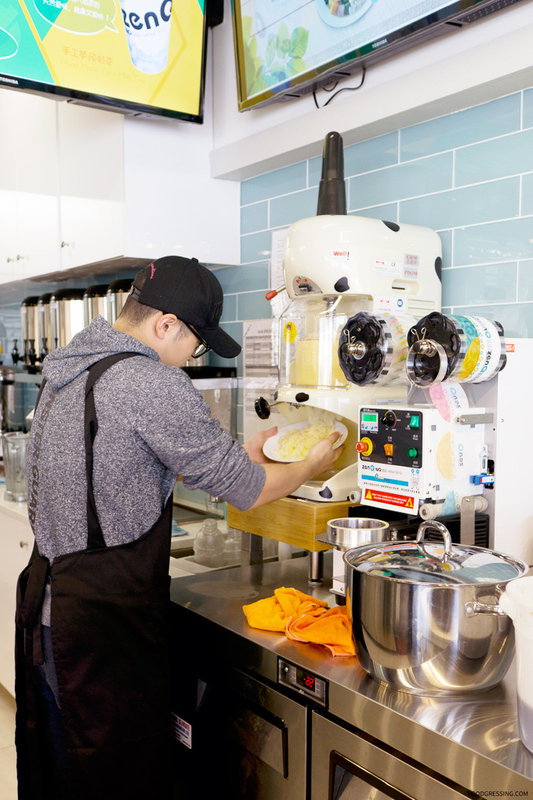 The soft serve itself is dispensed from a machine. The Cotton Candy is also made to order. 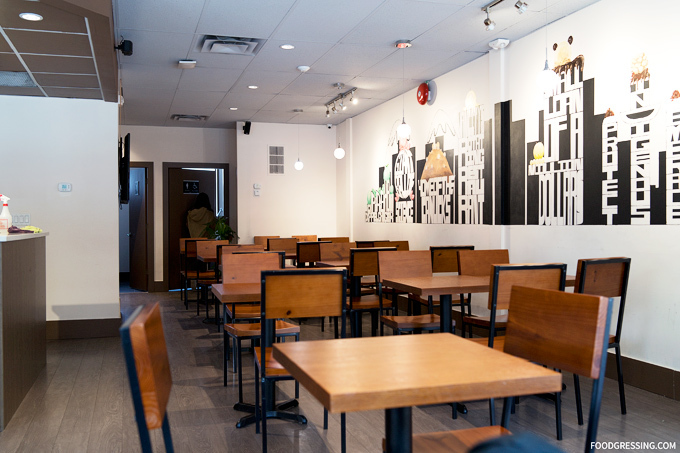 Milk Cow’s location in Richmond is modern, clean but minimal with a few small dining tables. 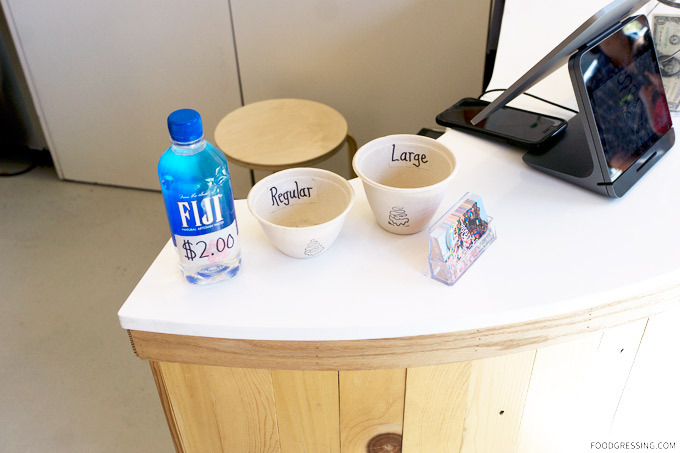 I liked that they have self-serve water pitchers for customers. Going in with my family, we tried two soft serves: the Santorini and the Milky Cube. The Santorini with its vibrant blue hues and whimsical cotton candy on the side is probably the most Instagrammable of all their offerings. The owner mentioned to me that it is on the sweeter side so I asked him to tone down the amount of syrup (just like I do at Starbucks). 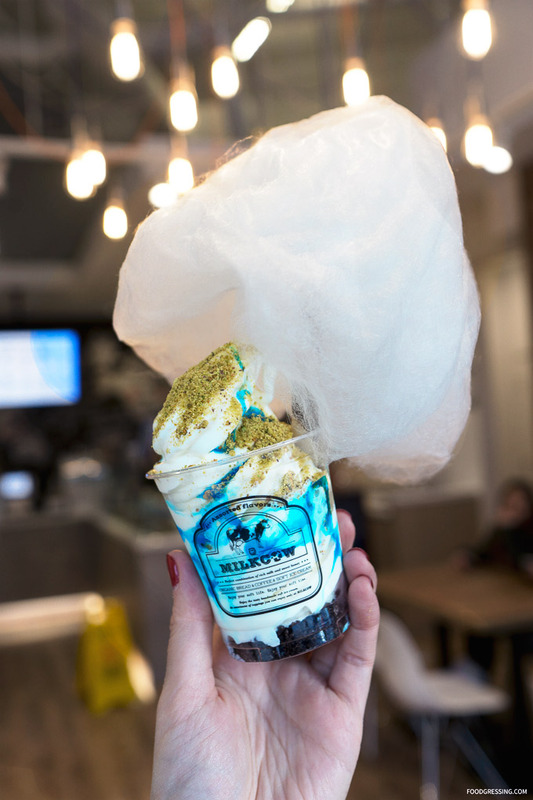 This soft serve came with Oreo Crumble, Tropical Blue Syrup, Pistachio Crumble and Cotton Candy. To start, Milk Cow’s organic soft serve was very good. I enjoyed its smooth and creamy nature although the taste seemed more like milk powder to me than regular milk. I usually assume that syrups that look “unnatural” probably taste very artificial but the Tropical Blue Syrup wasn’t too bad. The Pistachio Crumble was perhaps too fine as I thought the pistachio taste didn’t really come through. I’d probably prefer some large pistachio pieces instead of a crumble. 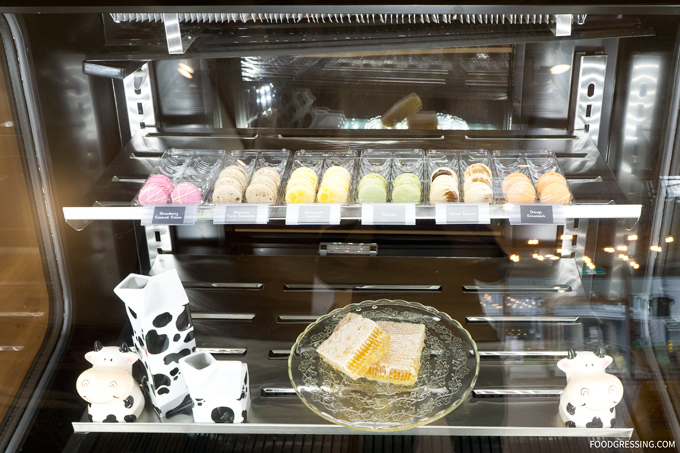 A more simple option that we tried was the Milky Cube which had a Natural Honeycomb on the side. In terms of taste, I thought that this one was more natural tasting and hence better in my opinion. The honeycomb was a nice touch as it had a beautiful honey taste and offered some fun sticky texture to the dessert. There was just one person (one of the owners) who was working the front and he was taking orders and making the desserts. There was a bit of a wait as a result but perhaps things will move more quickly when they hire more staff (they are hiring by the way!). 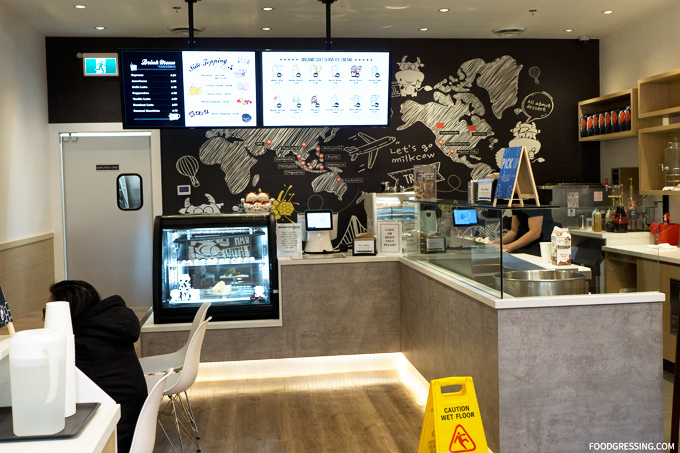 There’s a new reason to head to Marine Gateway to satisfy your sweet tooth craving. 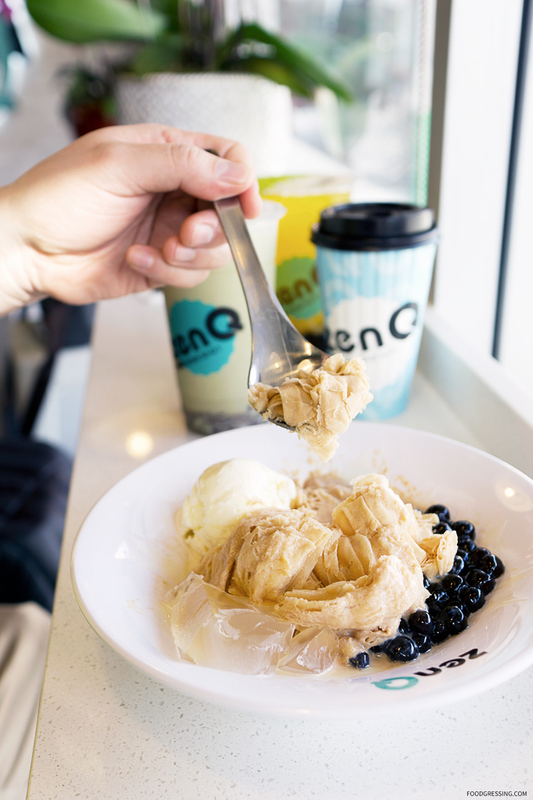 Originating from Taiwan, ZenQ is an international dessert chain that specializes in Taiwanese desserts and they opened their second Metro Vancouver location at 95 SW Marine Drive. The other location in operation is in Port Coquitlam and upcoming restaurants are planned for Richmond and Burnaby. 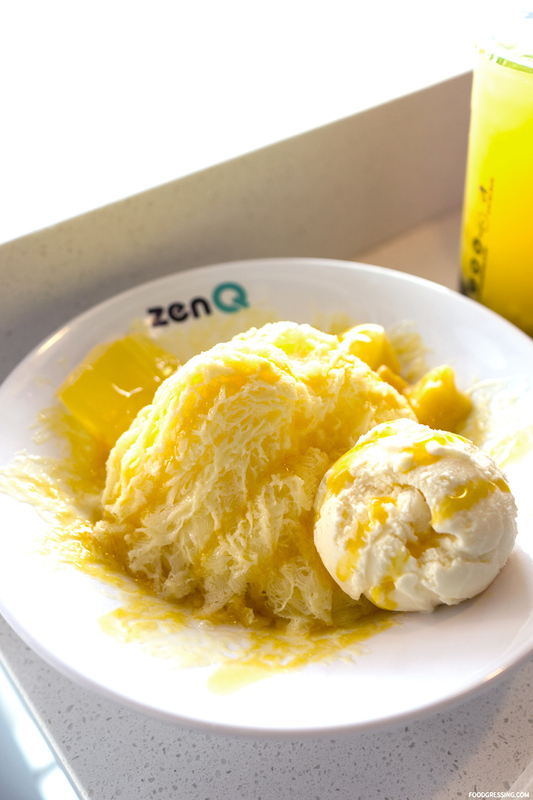 At ZenQ, you’ll find a range of sweet offerings ranging from their signature collagen-riched grass jelly series to glutinous rice desserts and shaved ice series. 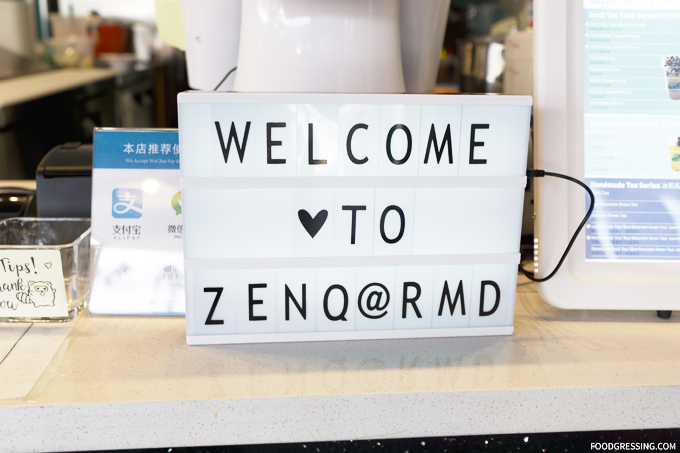 I recently visited ZenQ ahead of their official Grand Opening. 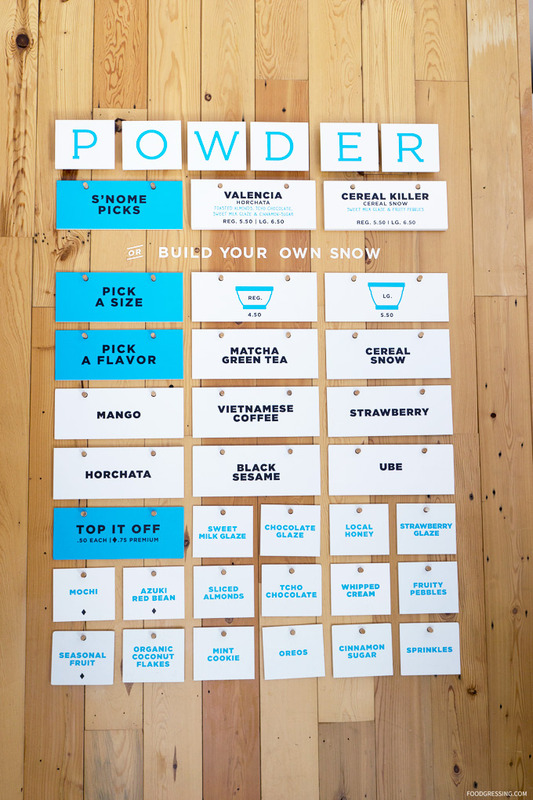 Here’s a look at what you can expect from this new dessert stop. 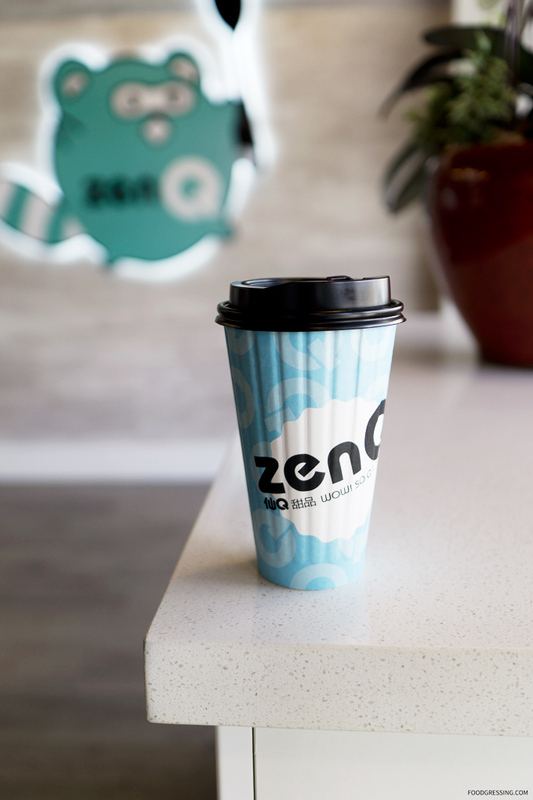 The interior of the new ZenQ location is modern, shiny and clean with a few dining tables. 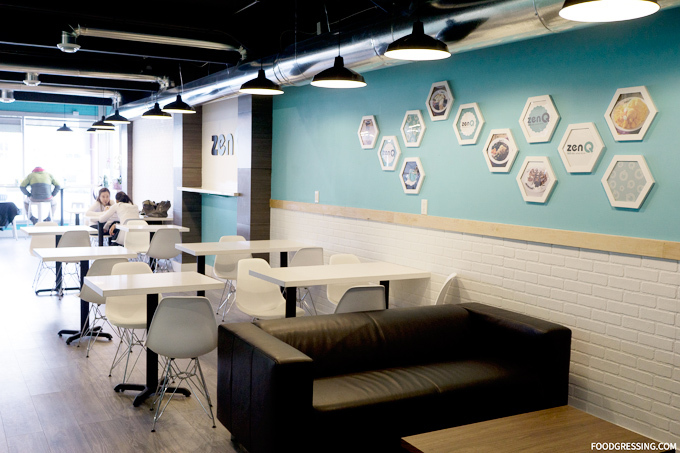 The setup is good for grab-and-go and small group while the space would be less accommodating for larger groups. 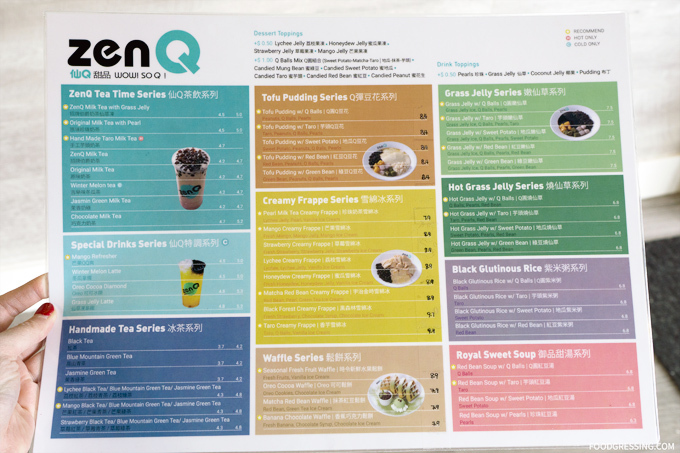 On the menu at ZenQ are a variety of Taiwanese-style drinks and desserts. 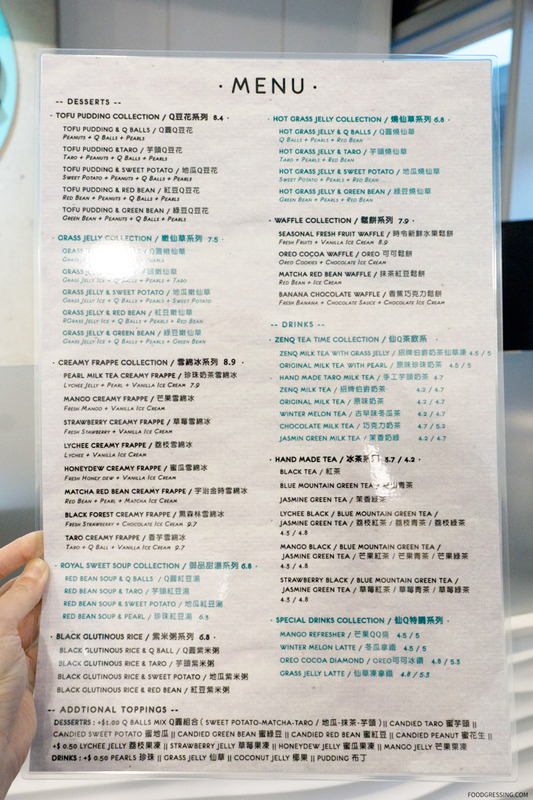 Drink series include ZenQ Tea Time Collection (like Original Milk Tea and Wintermelon Tea); Handmade Tea (like Jasmine, Black and Blue Mountain Green); and Special Drinks (like Grass Jelly Latte and Mango Refresher). 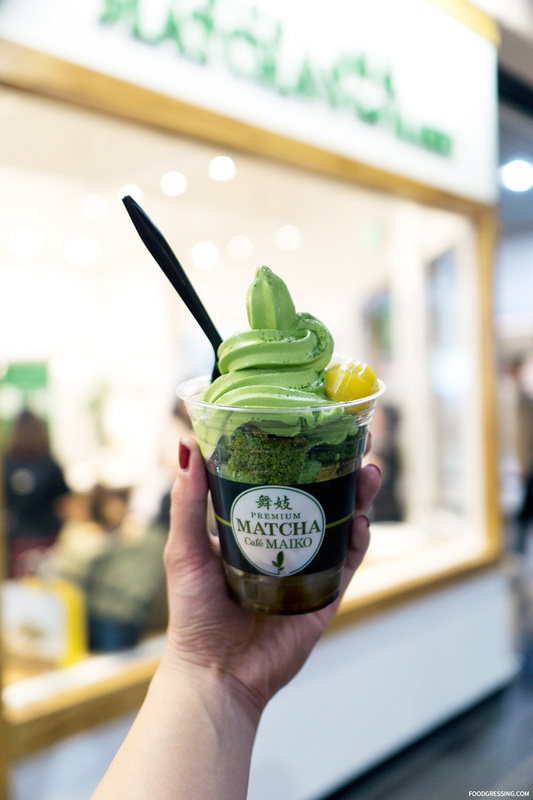 For desserts, there are Tofu Puddings, Grass Jellys, Creamy Frappes, Royal Sweet Soups, Black Glutinous Rice, Hot Grass Jelly and Waffles. Additional toppings are available at an extra charge. 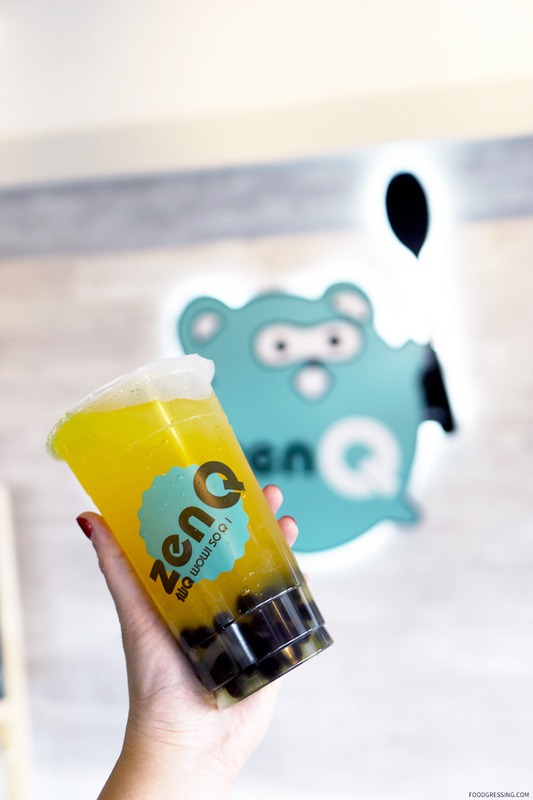 ZenQ is Chatime’s sister brand so you can expect similar flavour and quality for drinks. 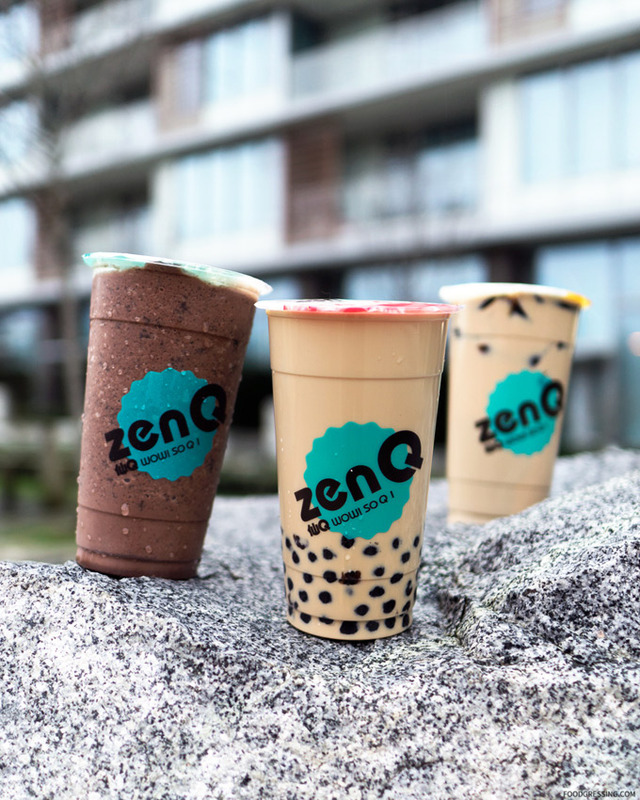 I tried three of their drinks: the ZenQ Milk Tea with Grass Jelly ($5.00), Original Milk Tea with Pearl ($5), and Oreo Cocoa Diamond ($5.30). For milk teas, the strength of the tea flavour and the texture of the jellys/pearls were on point. The grass jelly was soft yet firm and slightly sweetened. The pearls were soft and smooth on the outside but gradually more chewy towards the centre. The Oreo Cocoa Diamond was a chocolaty-slushy type of drink that was interesting the first couple of sips but perhaps too indulgent to finish in one sitting. 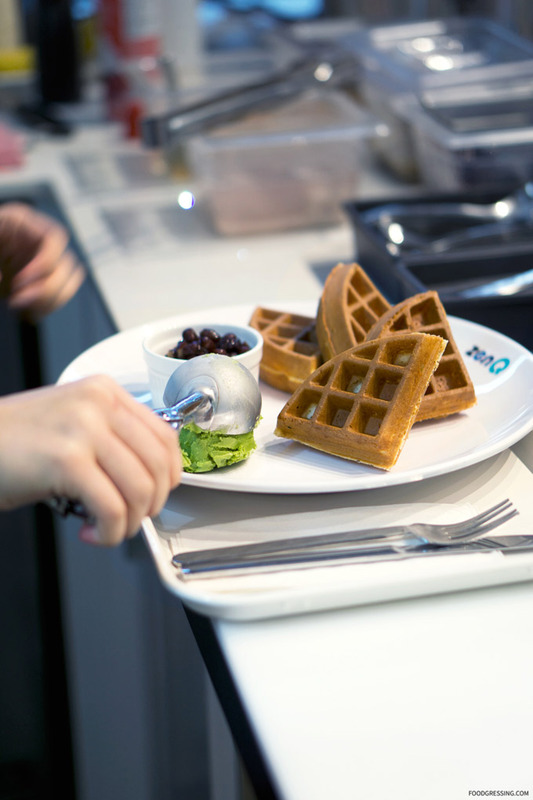 Waffles are made-to-order at ZenQ and I tried their Matcha Red bean Waffle ($7.90). 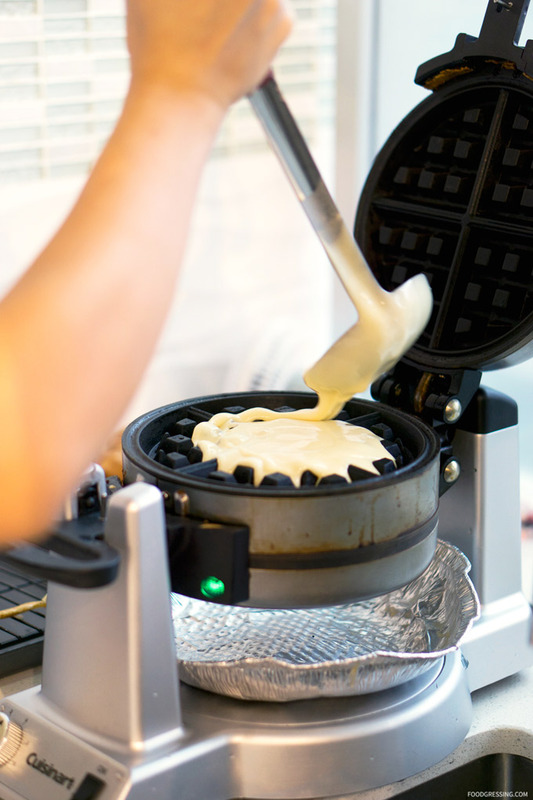 The waffles were perfectly crispy on the outside, light and tender on the inside and were topped with a sprinkle of icing sugar. The red beans came in a ramekin and were slightly sweetened. 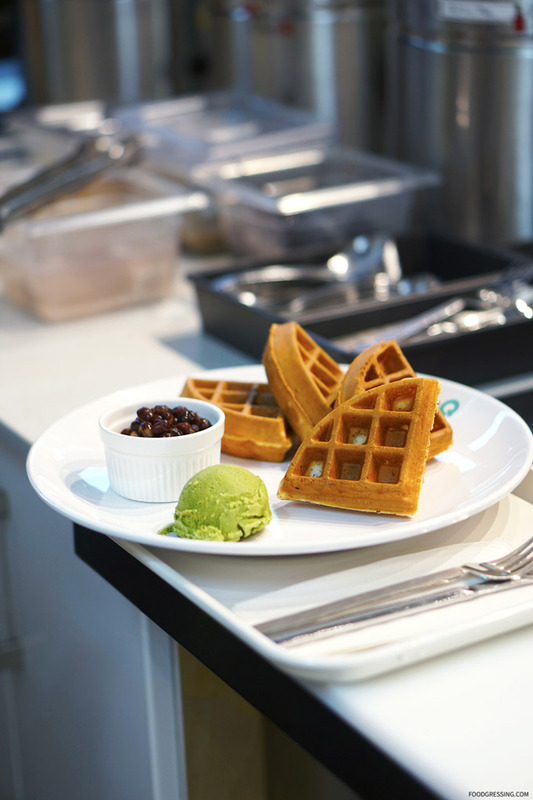 The green tea flavour for the dessert came from the ice cream while the waffle was plain. 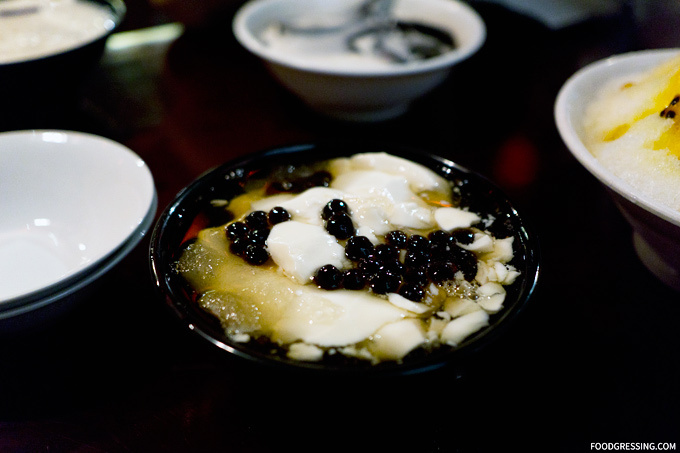 For a soft and smooth dessert, there was also the Tofu Pudding with sweet potato, peanuts, Q balls and pearls ($8.40). 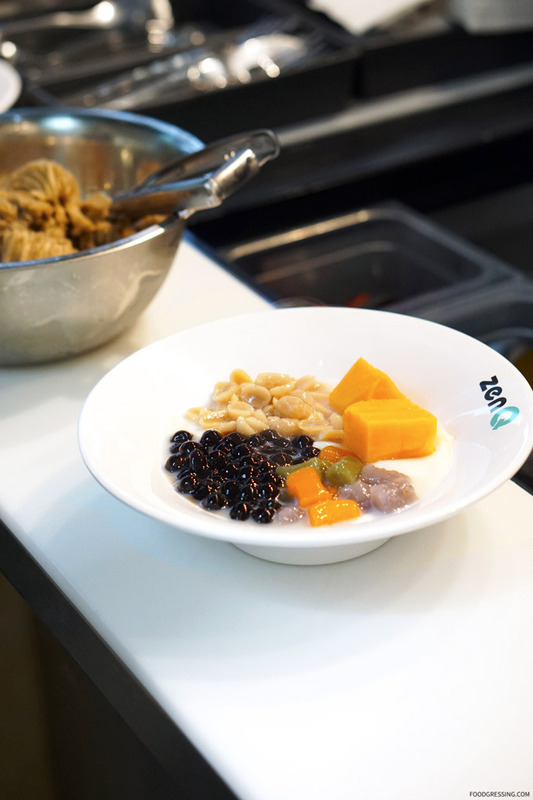 The quality of the ingredients were pretty good starting with the tofu pudding being silky; the peanuts being crunchy; the Q balls and pearls being chewy but soft on the inside; and the sweet potato being soft and sweet. Check out the video on how they put this dish together. One of the desserts that was recommended to me was the Taro Creamy Frappe with Q balls and vanilla ice cream ($9.70). The shaved ice had quite a prominent taro flavour which was impressive. Below is a video of how the dessert is assembled. CinCin is one long-standing restaurant in Vancouver serving upscale Italian dishes, handmade pasta along with an extensive wine menu. But in case you want to take a bit of the dining experience home after a delightful meal at CinCin, you might consider one of their delectable Take Home dessert boxes. Last week, I attended a small media gathering at CinCin and at the end we were presented with box full of goodies prepared by CinCin’s Pastry Chef, Lewis Birch. Our box contained a variety of housemade sweets including Passionfruit Jelly, Peppermint Bonbon (pink and white), Lime and Mint Bonbon (dark green), Raspberry Truffle and Brandy Truffle. There were also some very unique macaron flavours: Duck Fat Caramel (blue), Orange and Clove (orange), Pecan and Black Truffle (white). 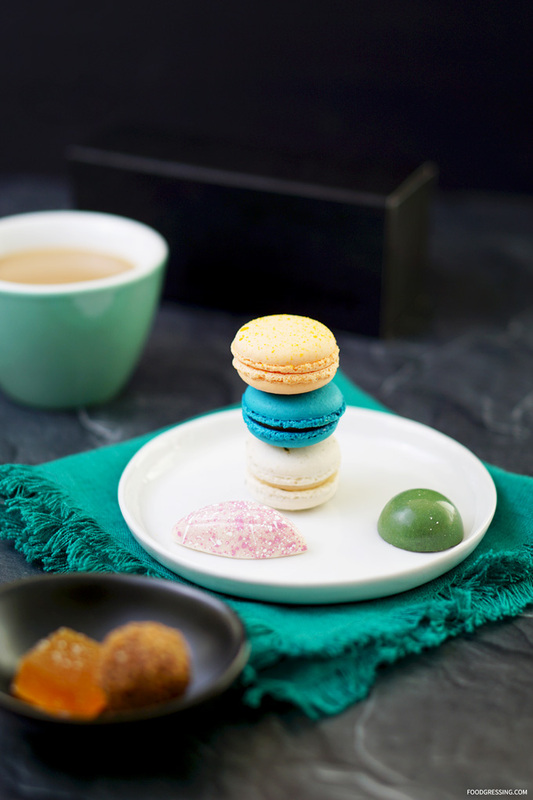 While all the treats were very tasty, it was love at first bite with the Orange and Clove macaron. I absolutely loved the mild citrusy flavour. For more information in CinCin, visit cincin.net. 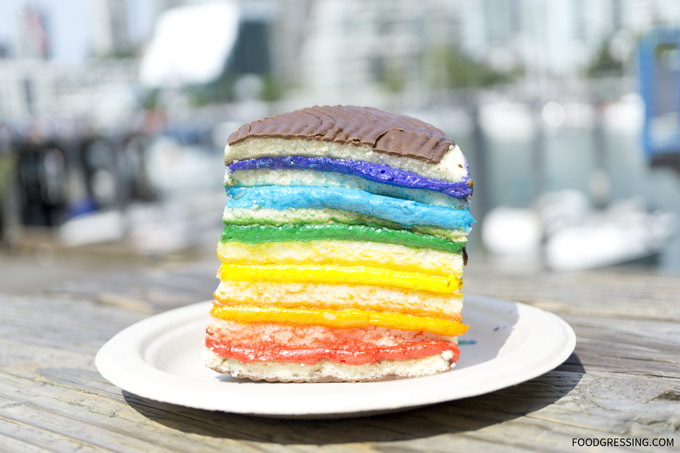 One of my fun eats from the summer was a Rainbow Layer Cake from Tartine Bakery on Davie in Vancouver. This cake was created to celebrate Vancouver Pride 2017. It had 6 layers (purple, blue, green, yellow, orange, and red) and sprinkles on top and on the side. It was not overly sweet, light, fluffy and delicious! Note: None of the cakes in this post were complimentary. All opinions are my own. 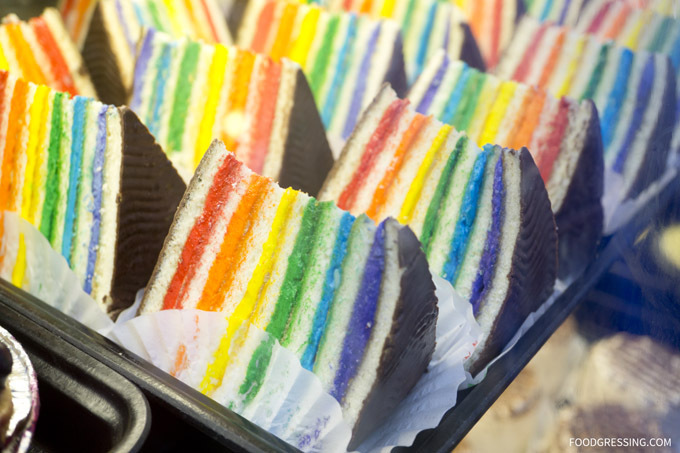 Another place that sells Rainbow Cake is Stuart’s on Granville Island. 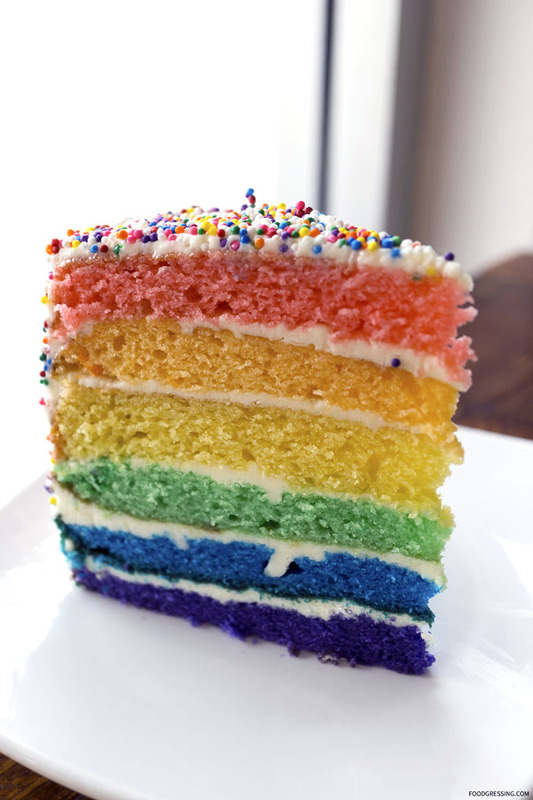 I believe Stuart’s created these for Vancouver Pride but kept them on the regular menu as they had become so popular.